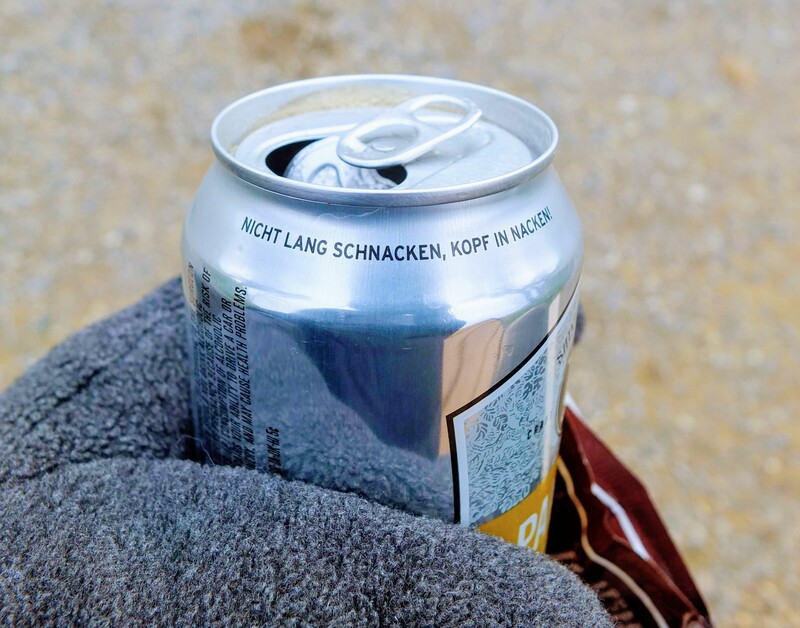 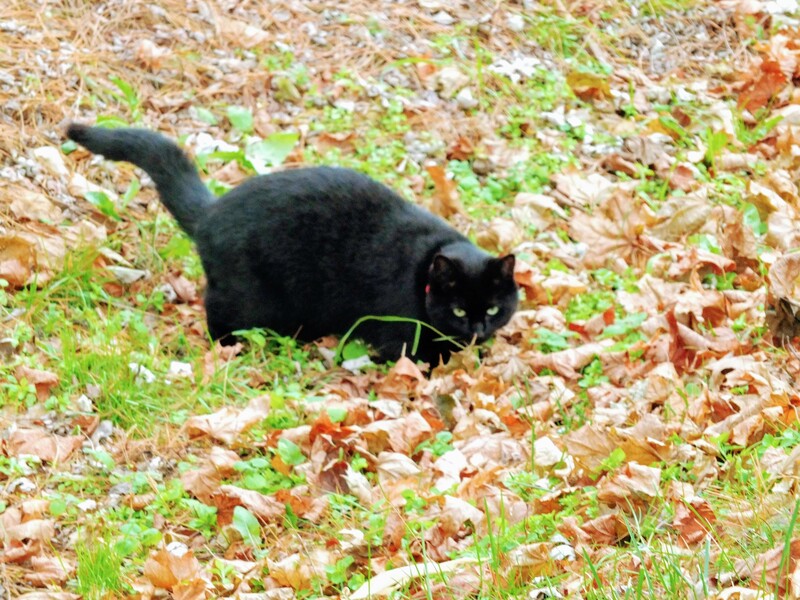 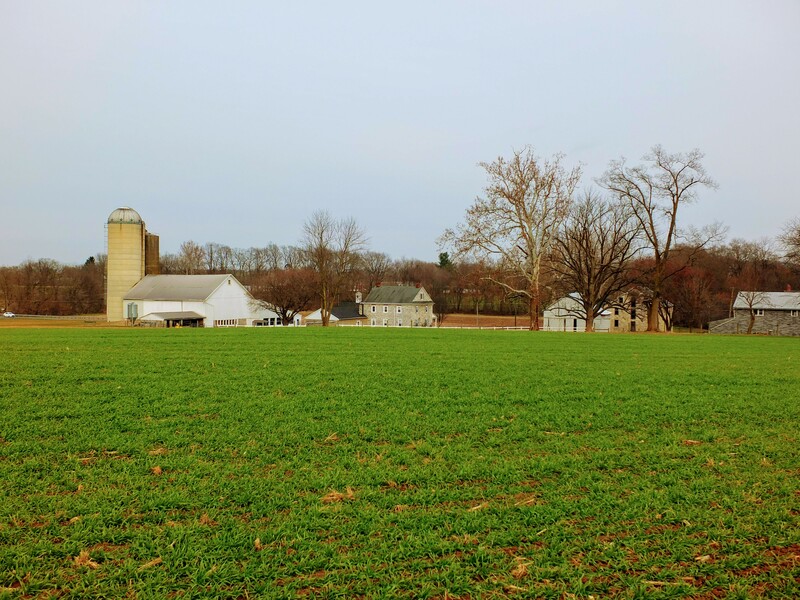 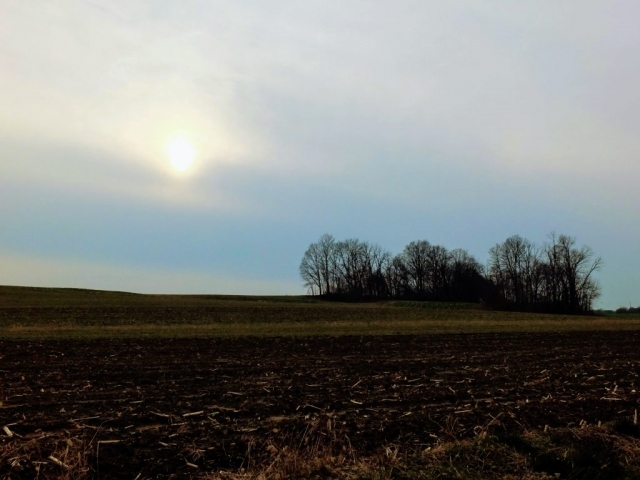 A chilly winter day and I was out to find a hike, walk, breweries, and beers in Lancaster County, Pennsylvania. 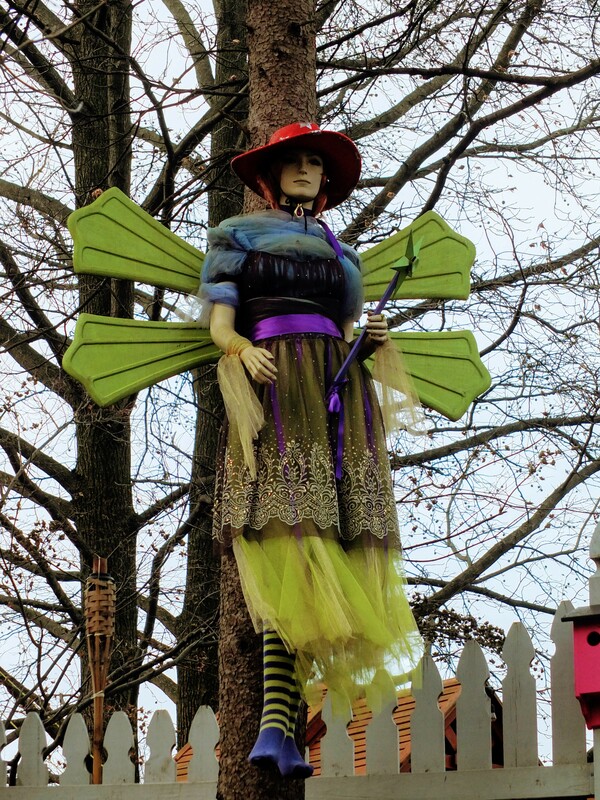 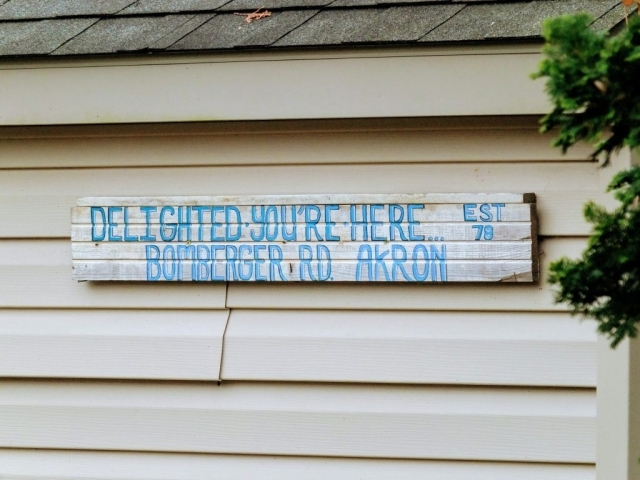 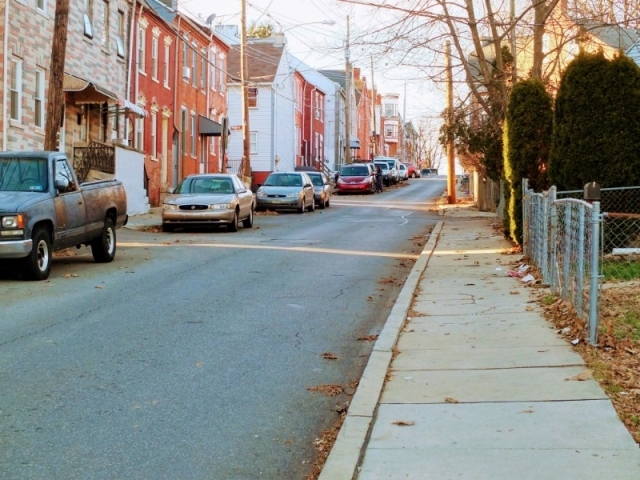 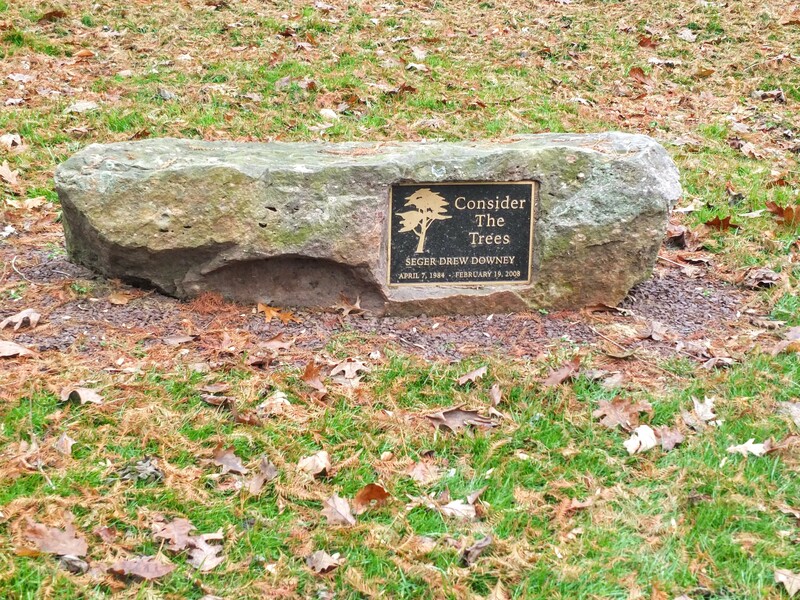 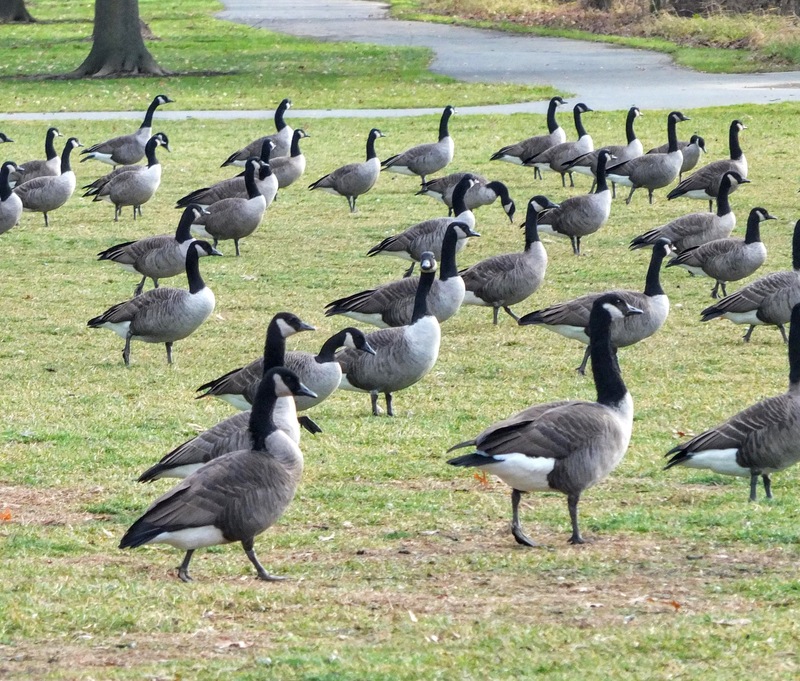 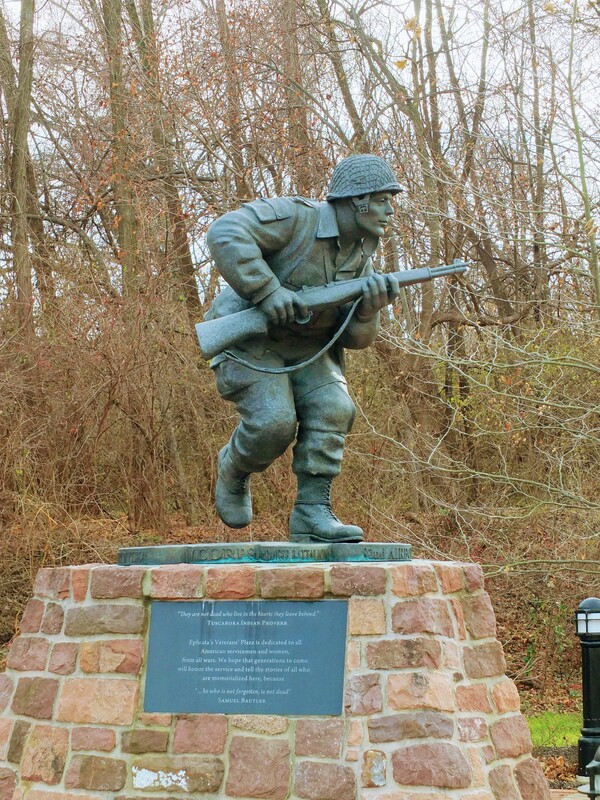 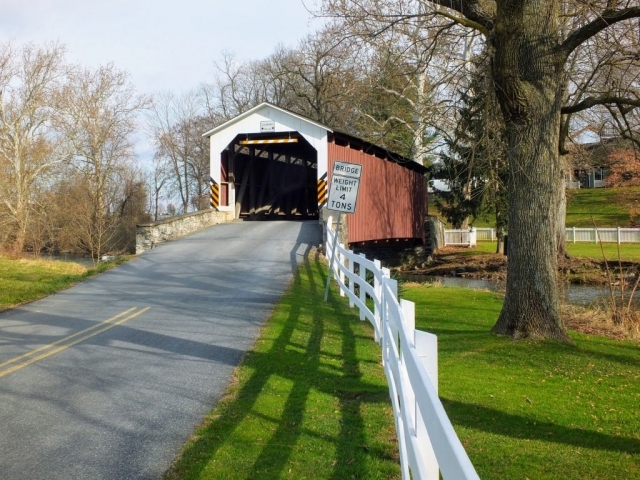 I’ve visited this area of southeastern Pennsylvania many times over many years. 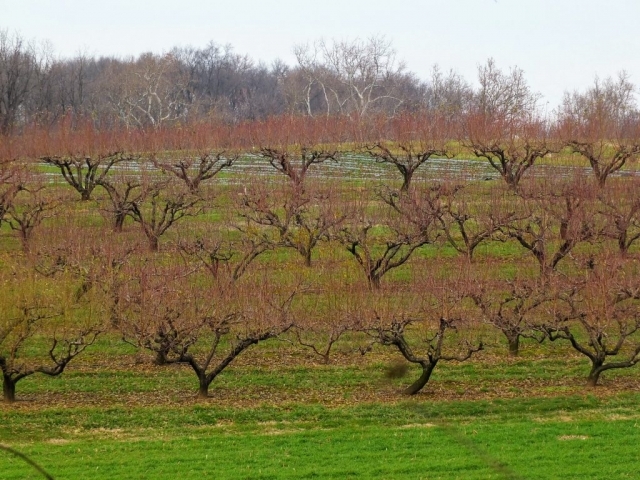 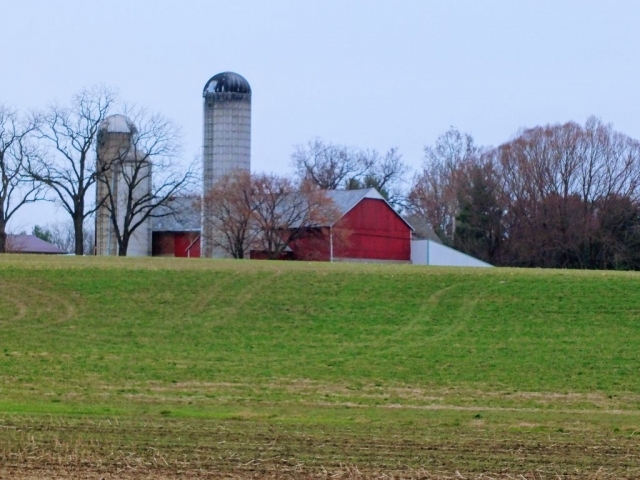 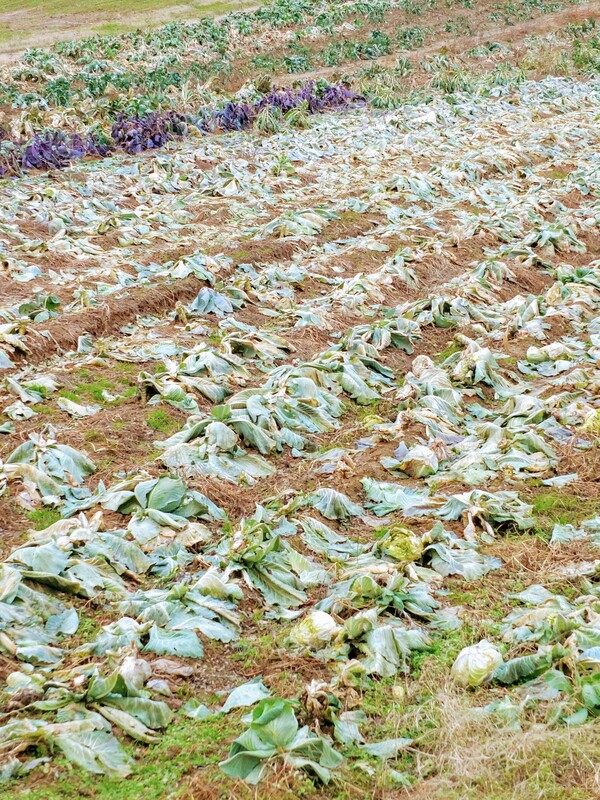 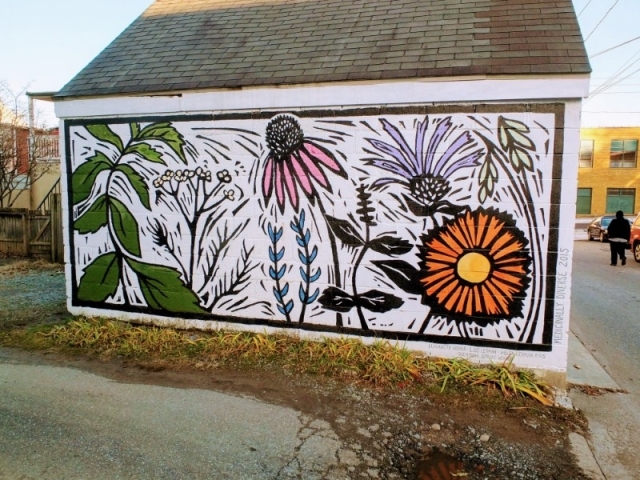 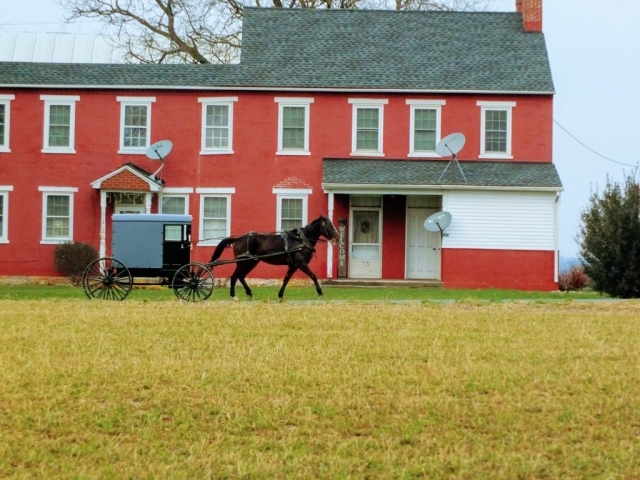 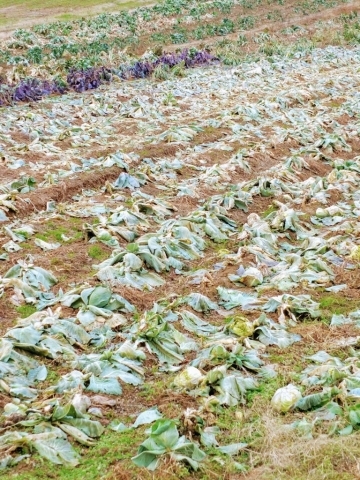 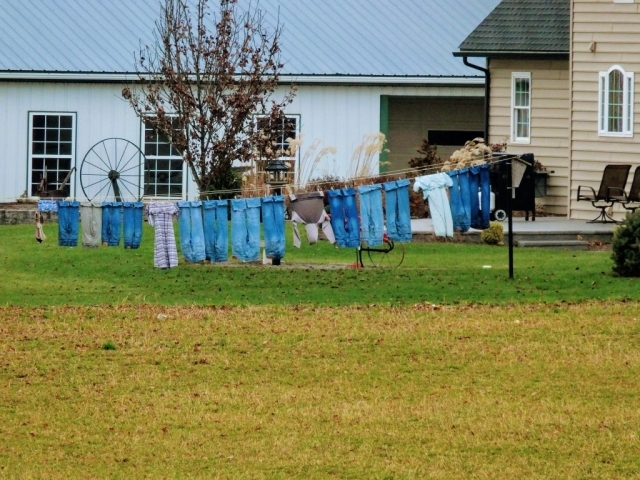 There is a charm here from the rolling farmland landscapes, long history, and the quaint presence of Amish, Mennonite and other interesting cultural legacies. 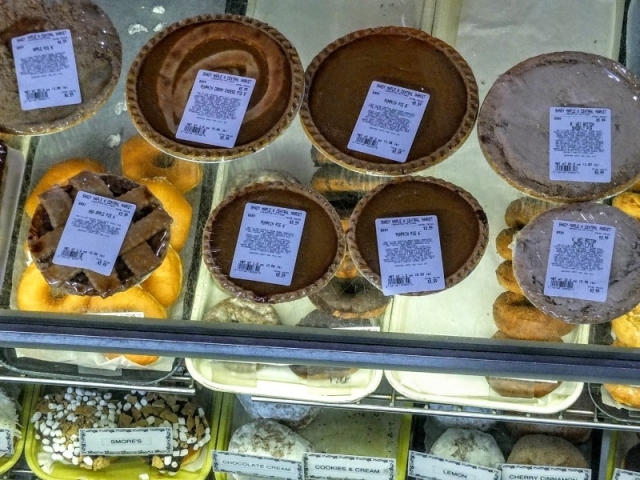 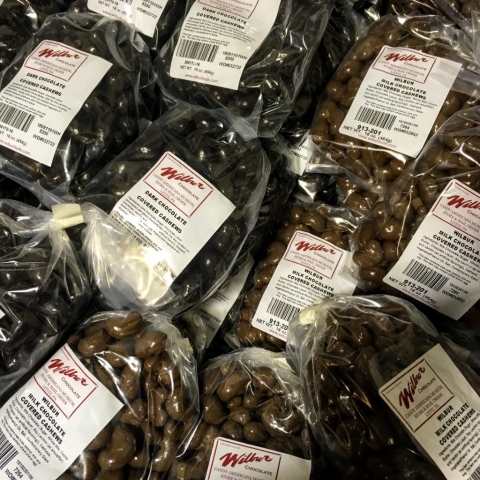 There are interesting local foods like whoopie pies, scrapple, and shoofly pie to find along the way. I also passed an historic marketplace, America’s oldest pretzel factory, and a chocolate factory along my way. 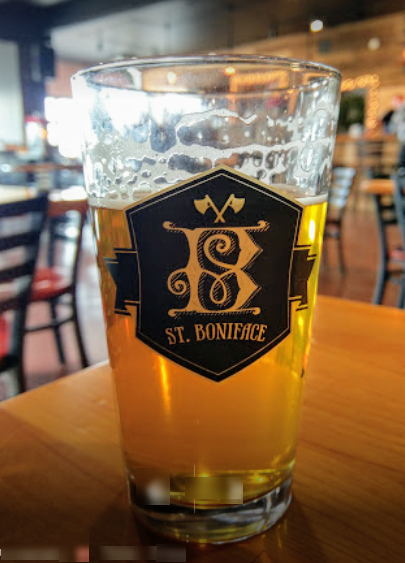 I have a routine I follow now days when traveling to any area that calls for searching out and mapping interesting hike possibilities then layering brewery locations on to the map to see what might coincide. 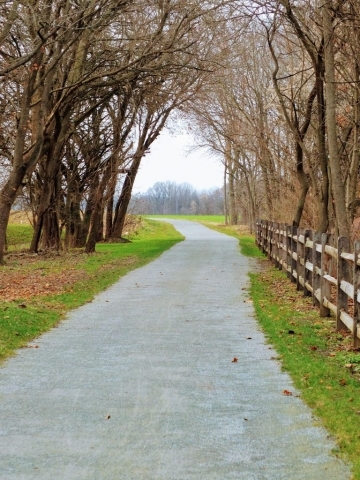 One of my “go-to” places to look for hikes in U.S. localities is Traillink, the trails database of the Rails to Trail Conservancy (RTC). 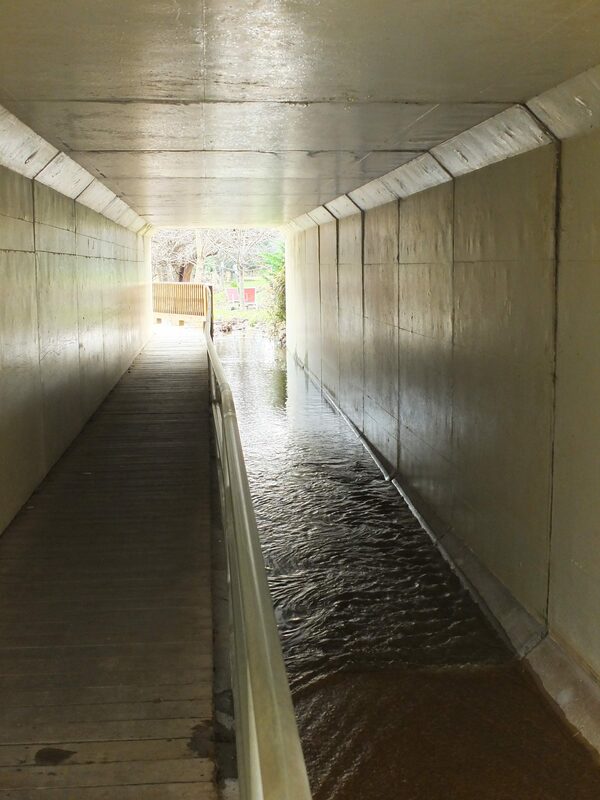 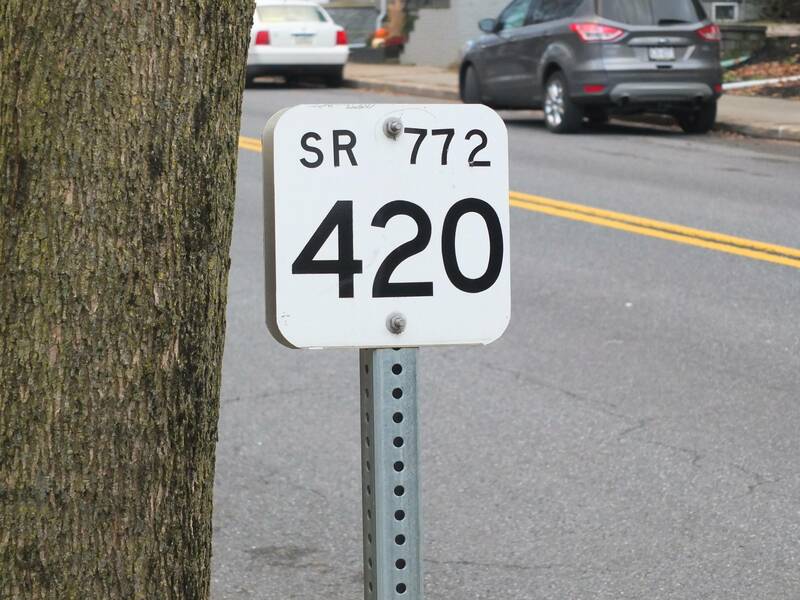 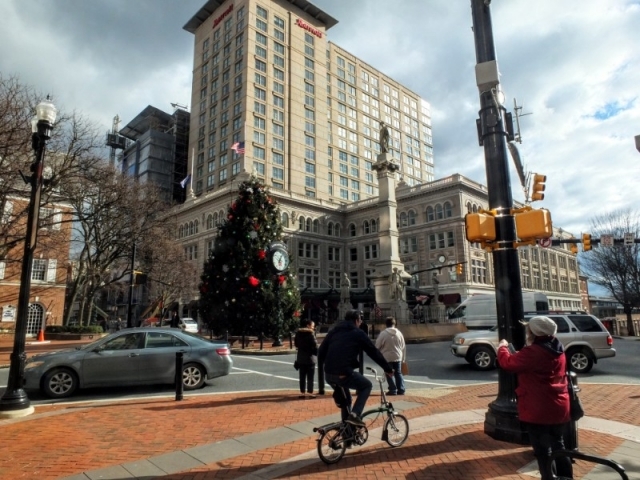 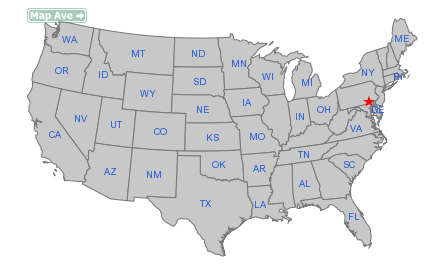 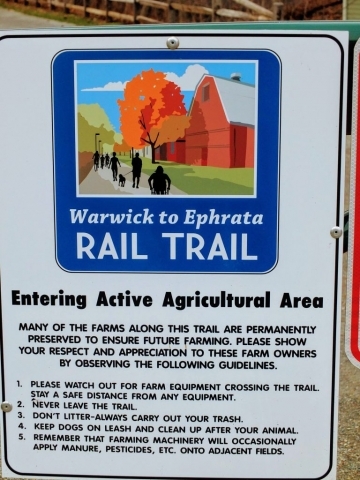 The RTC, if you don’t know about it, focuses on fostering the development of a network of trails throughout the country that take advantage of defunct rail line right-of-ways and other connecting corridors. 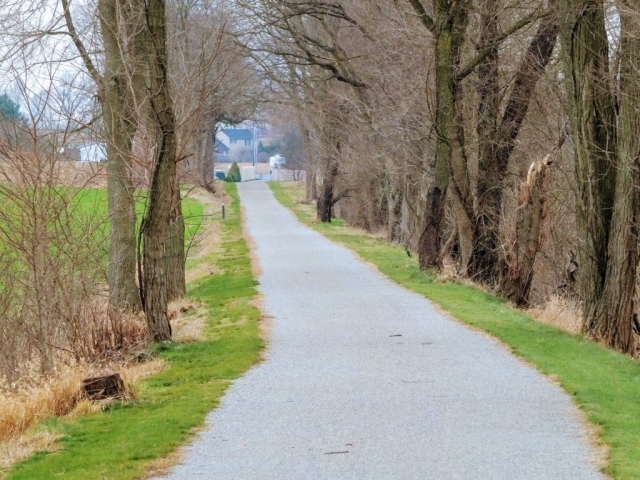 The trails shown in Traillink generally avoid congested auto routes but go where trains used to go. 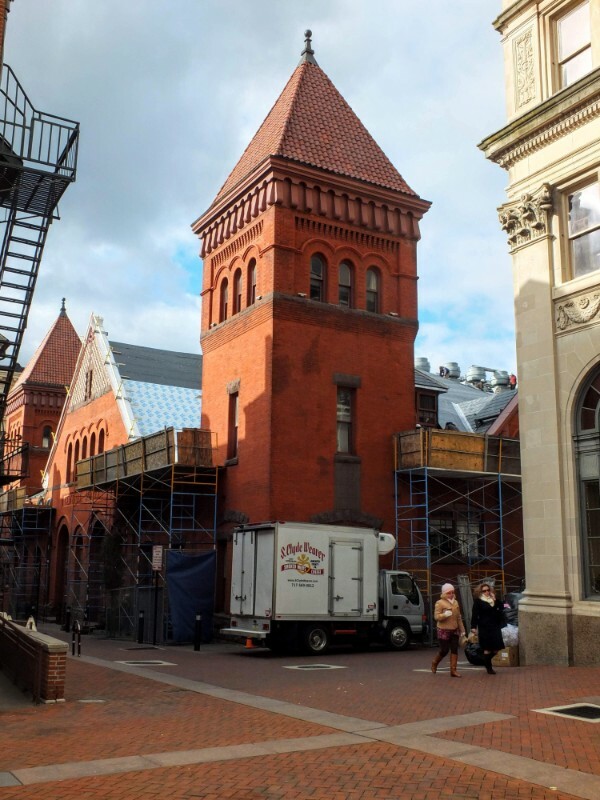 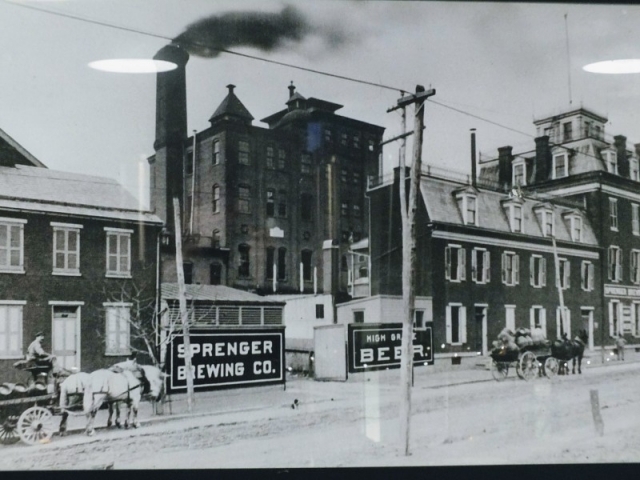 Where “trains used to go” is often a match to where breweries are today. 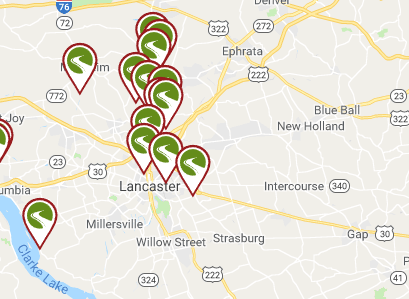 In the case of Lancaster County, once I overlaid brewery locations a hike combining two of the trails popped out at me. 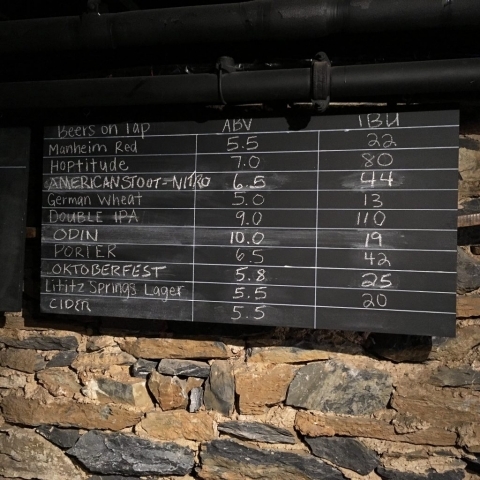 Add to that a beery walk in the center of Lancaster City and I had my walking orders. You may click on any gallery image to see it in a larger format and to open a slideshow viewer that lets you scroll through larger versions of all images. 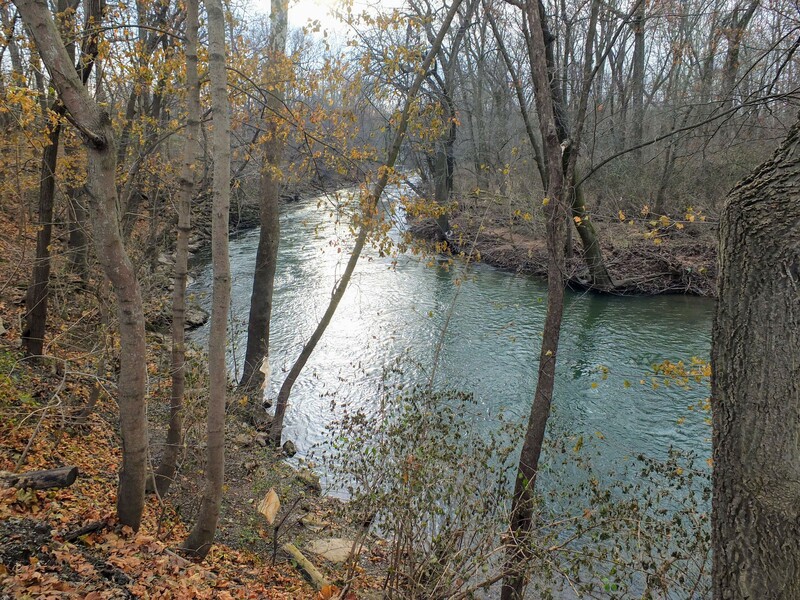 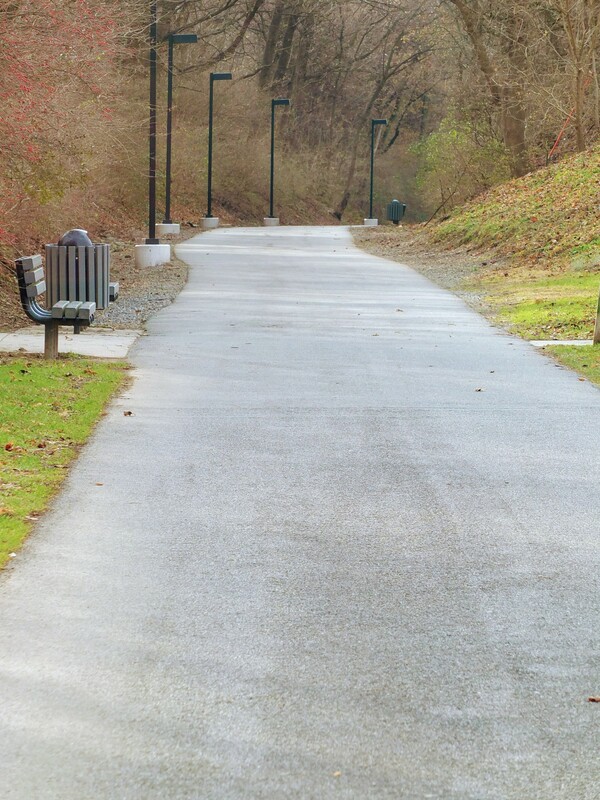 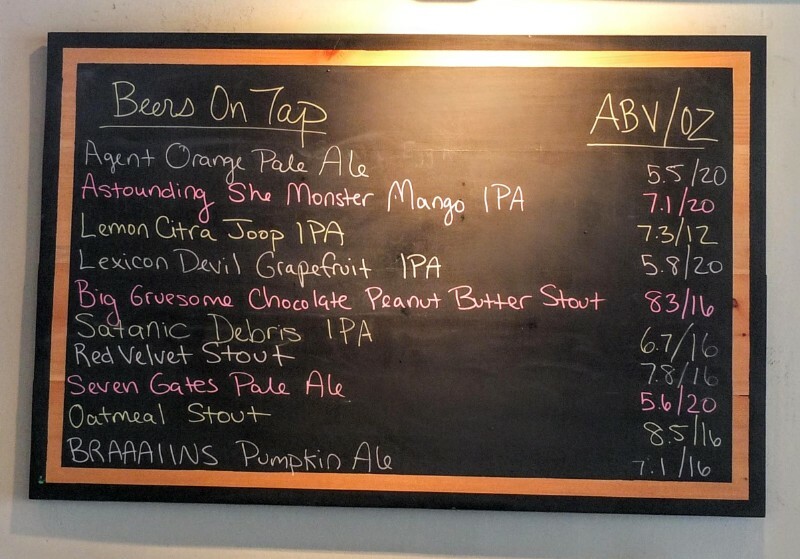 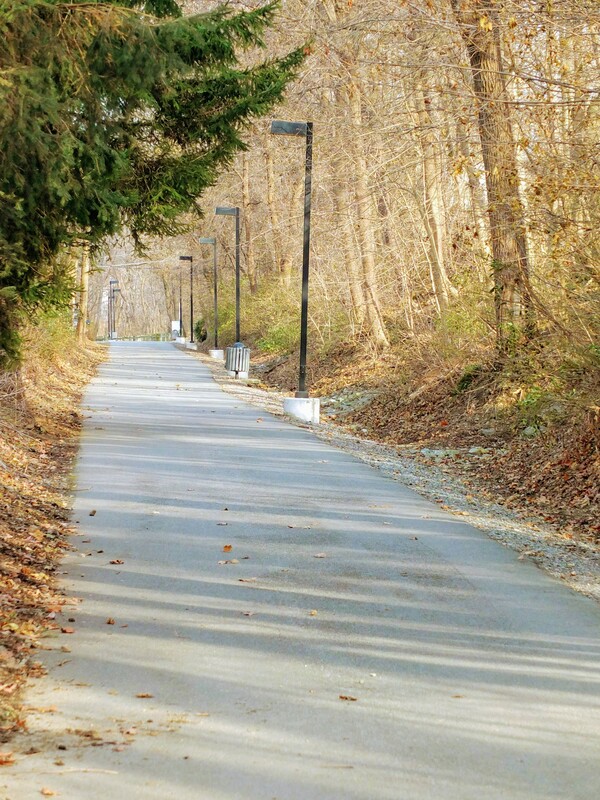 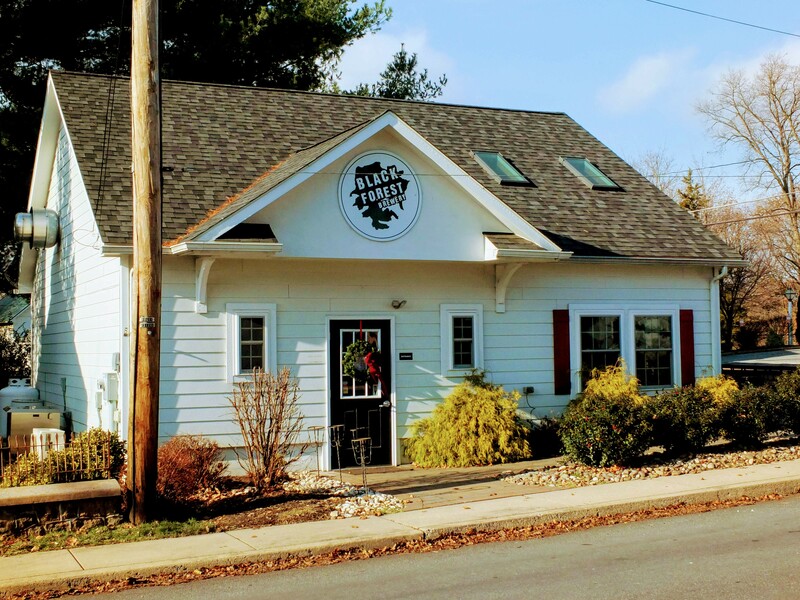 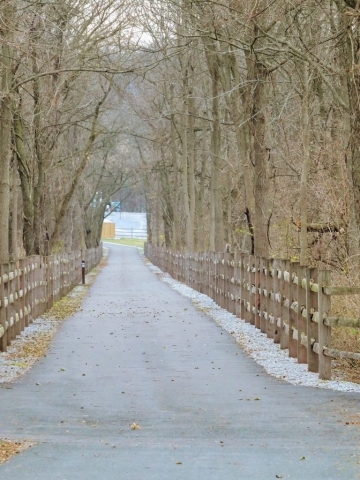 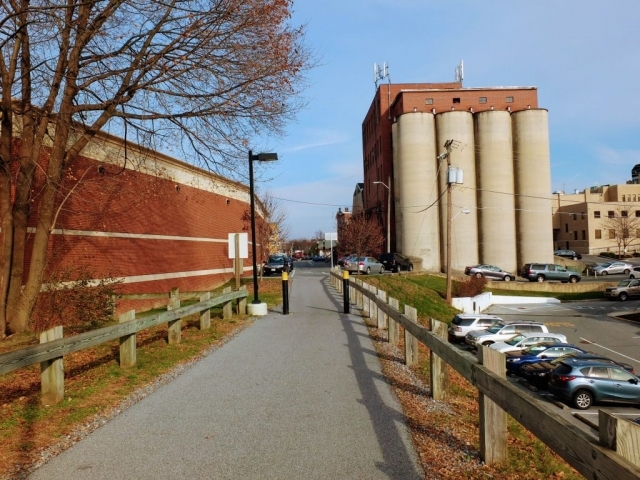 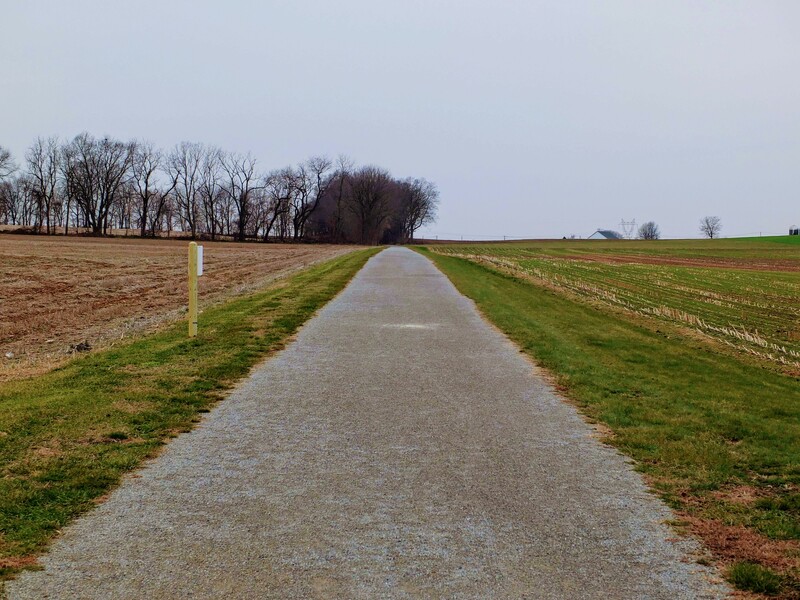 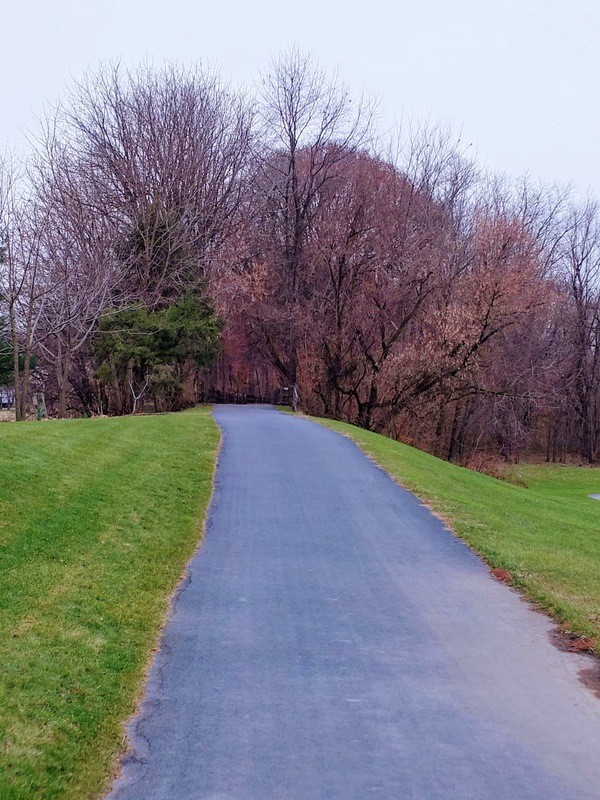 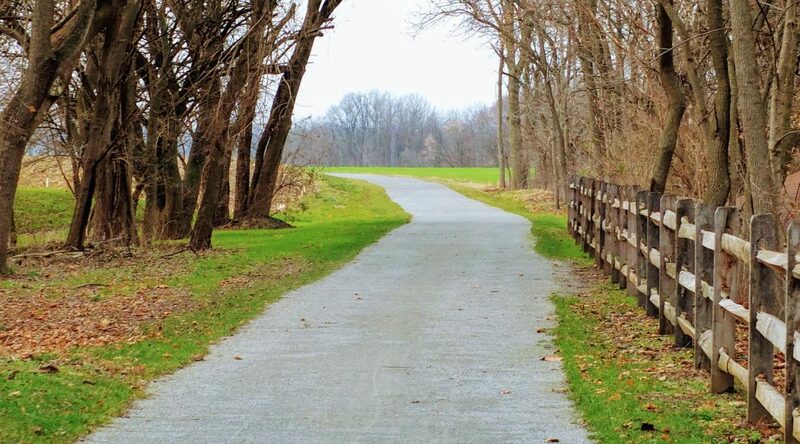 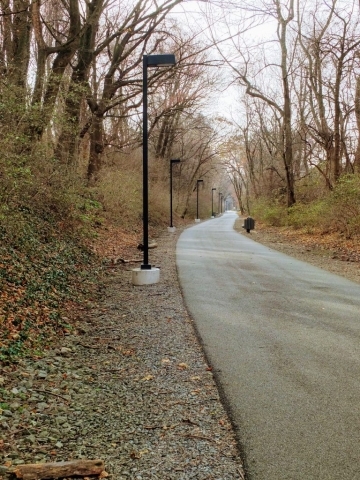 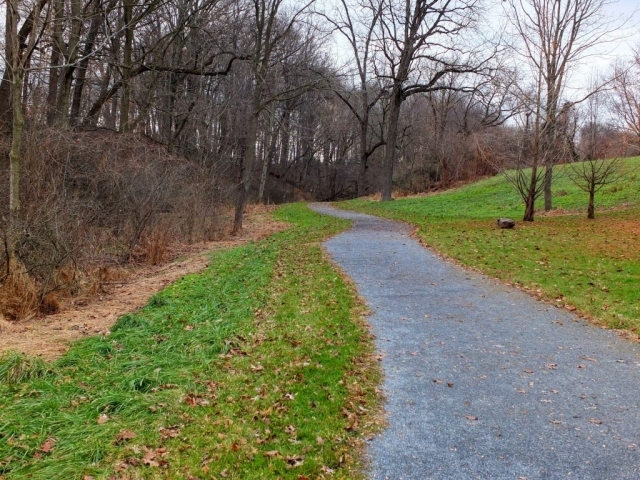 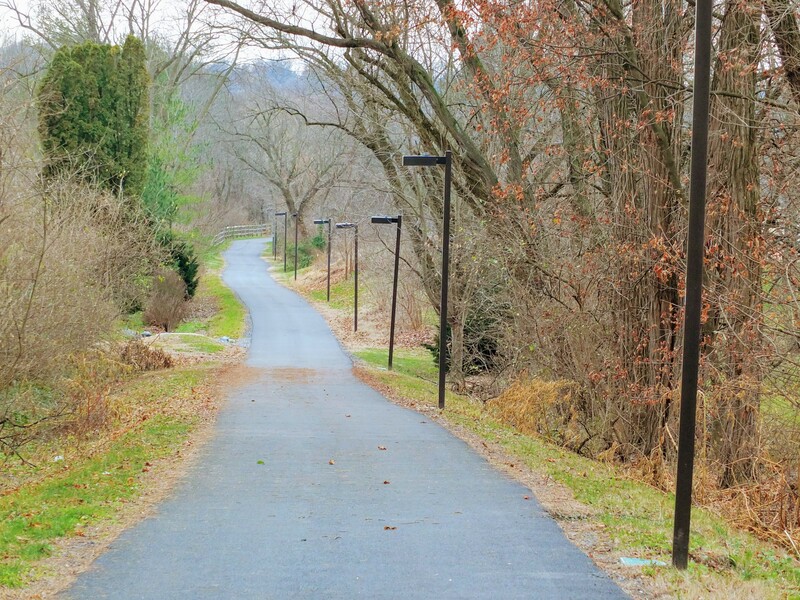 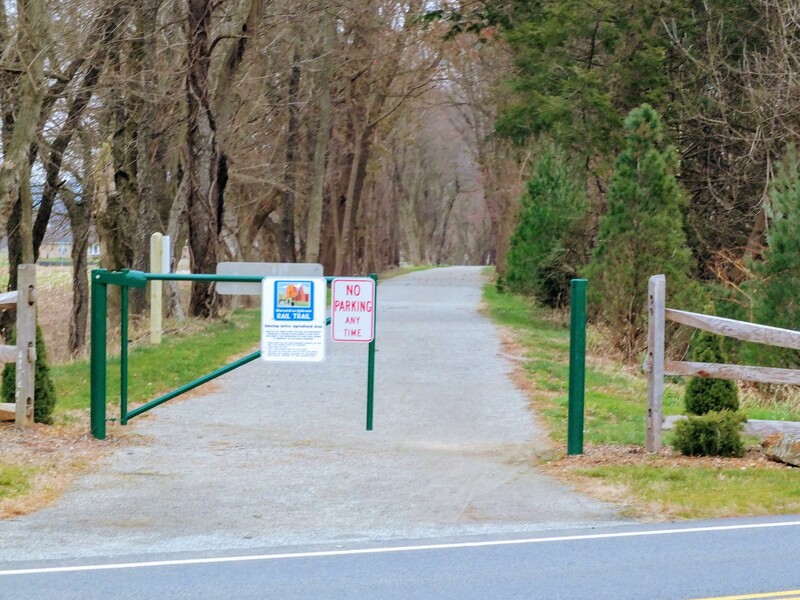 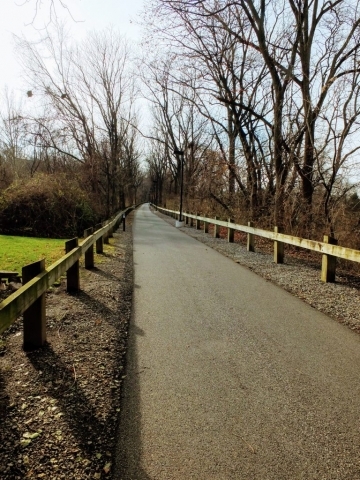 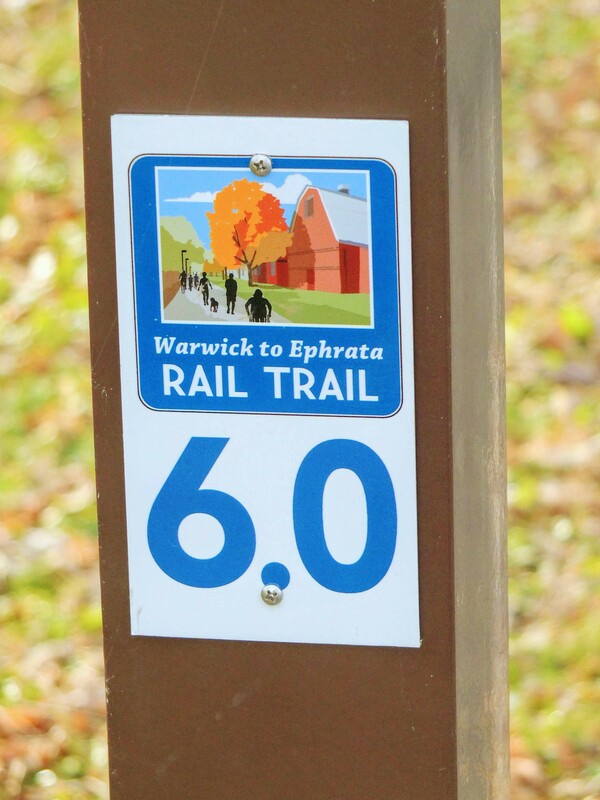 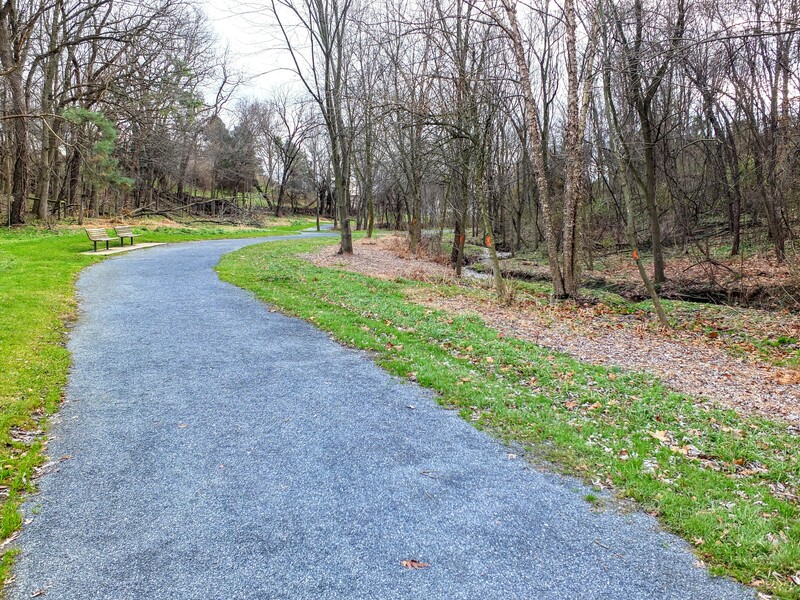 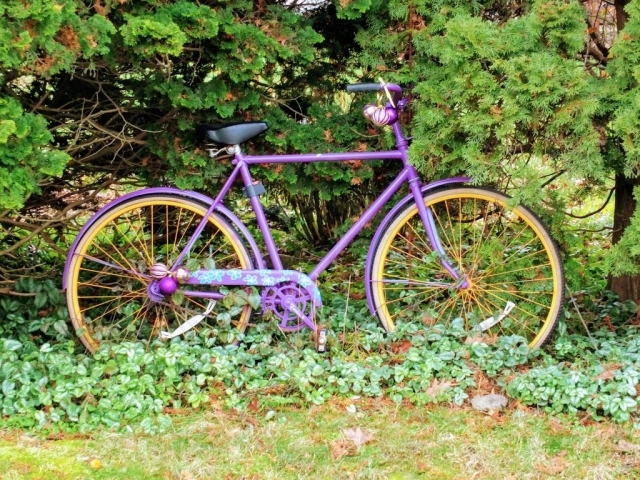 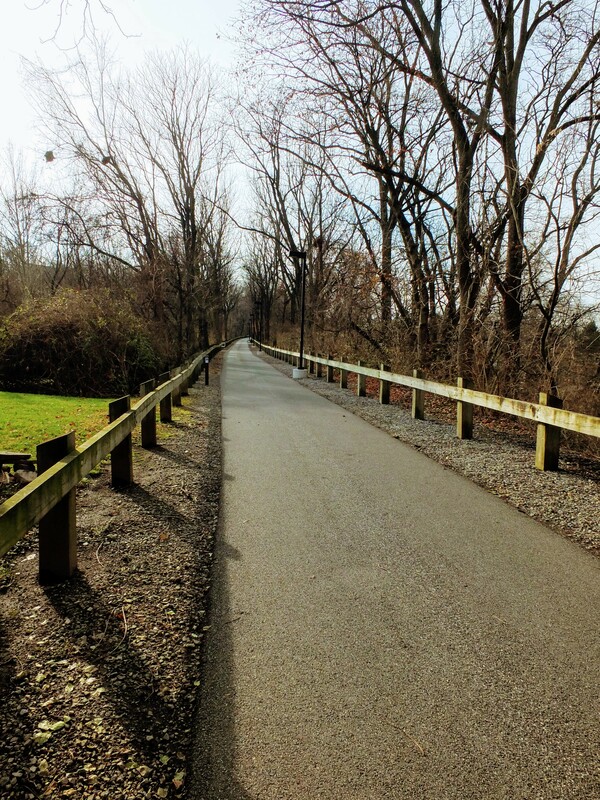 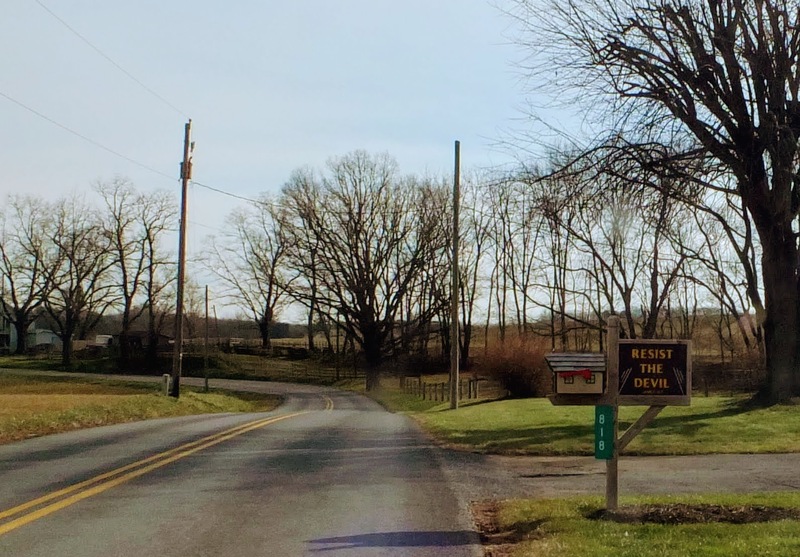 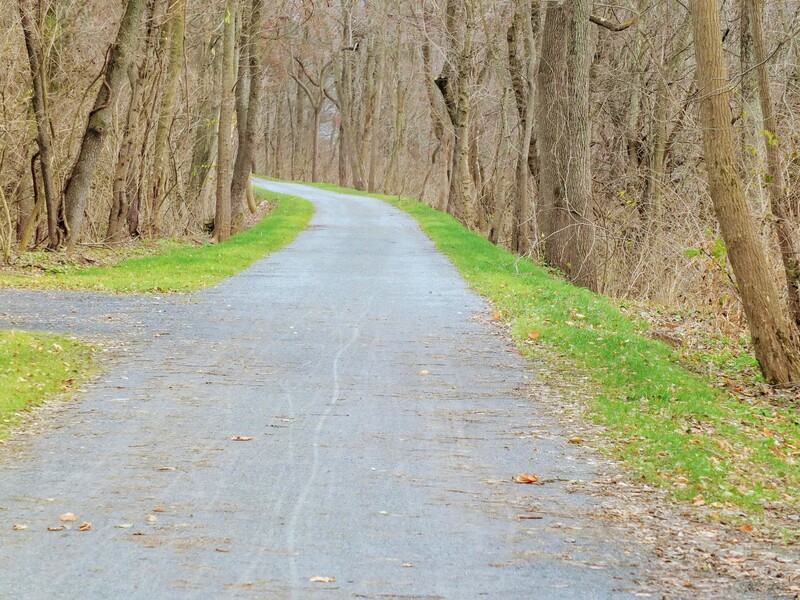 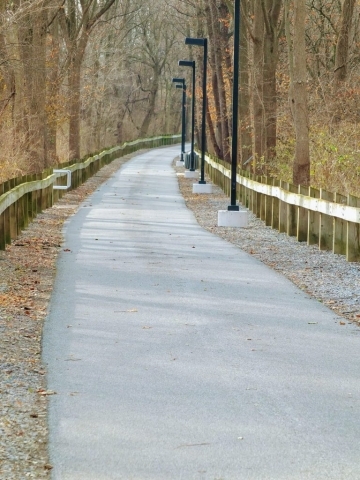 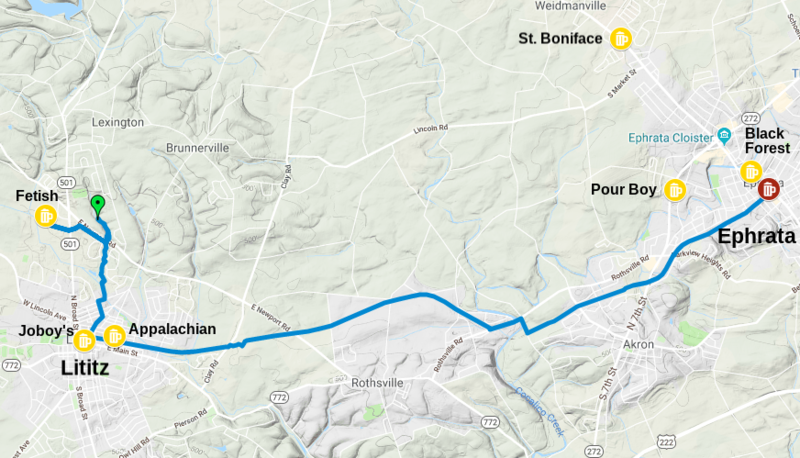 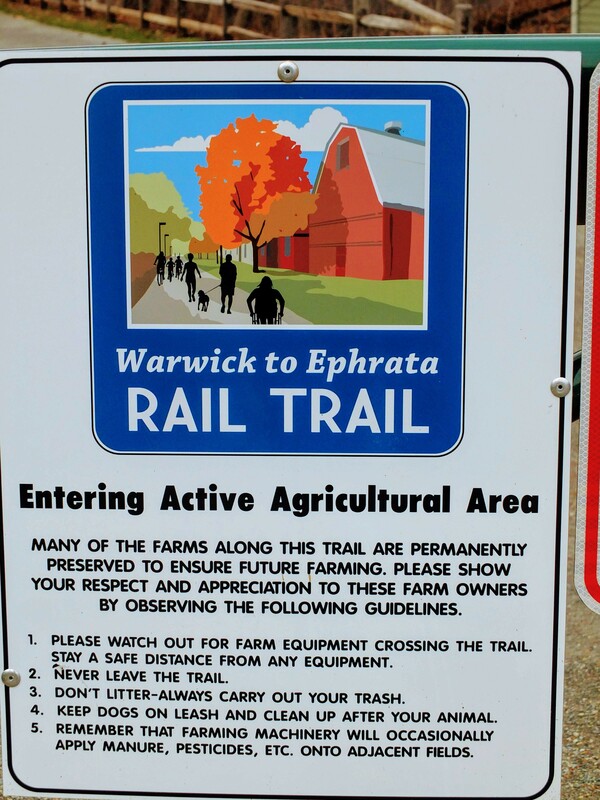 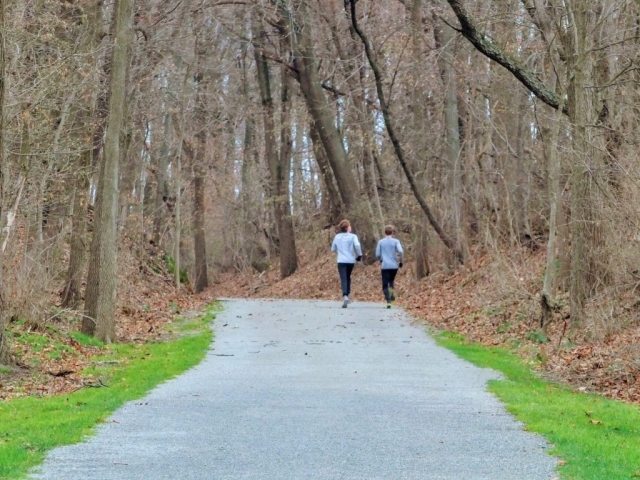 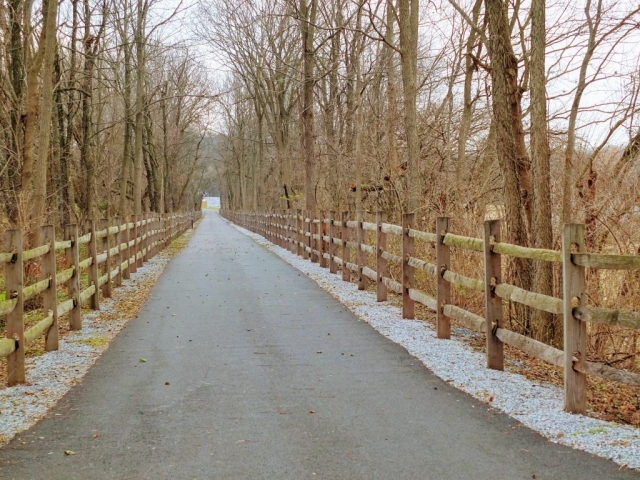 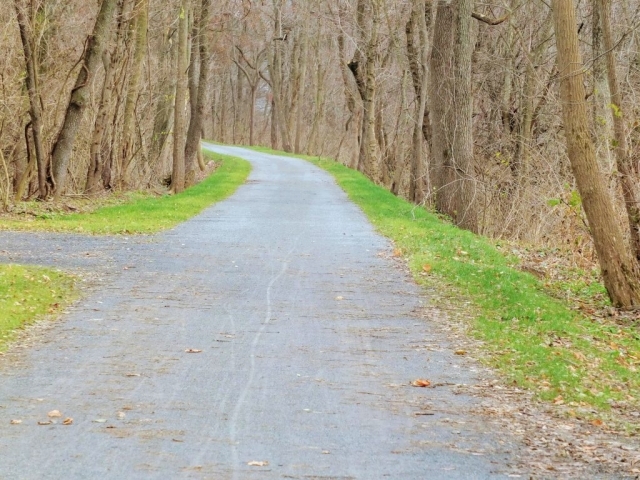 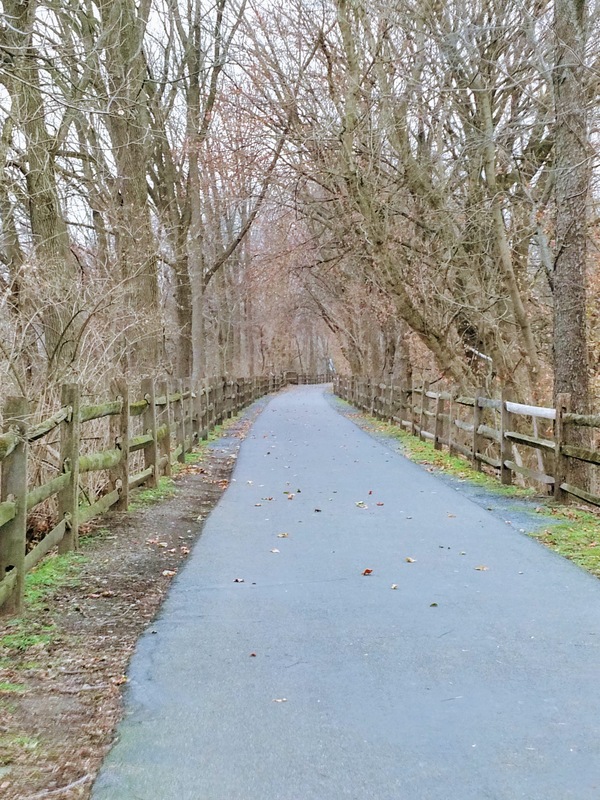 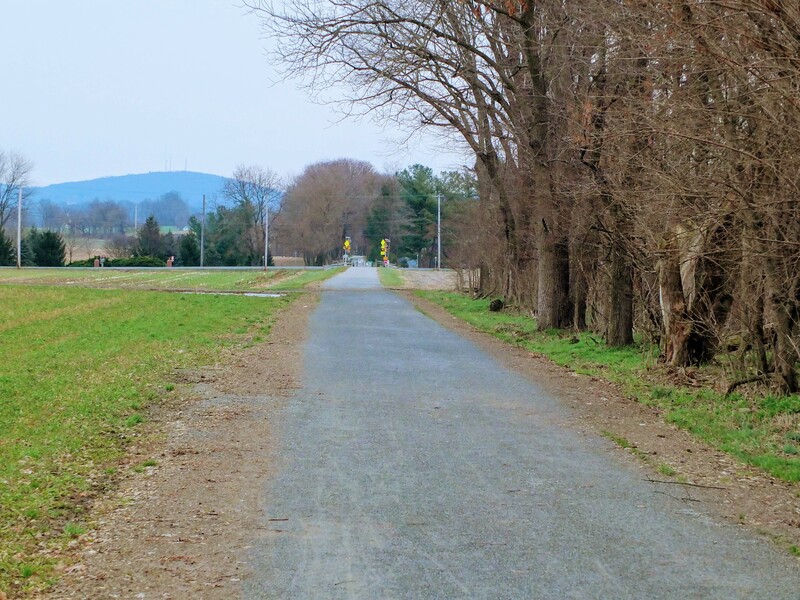 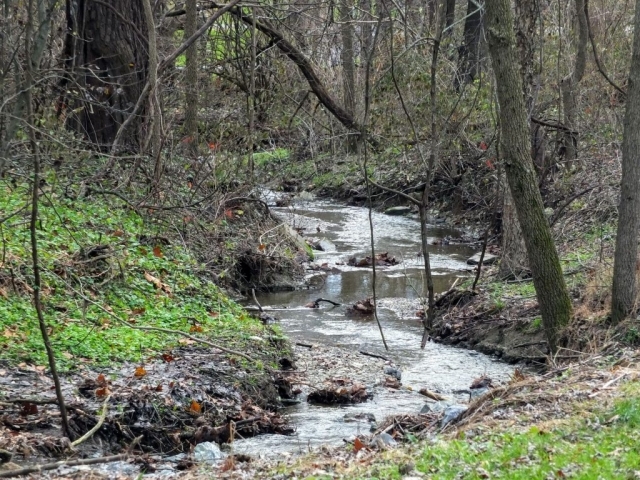 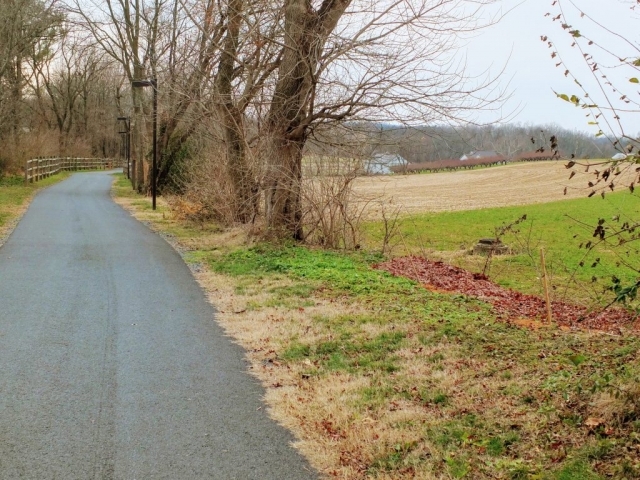 The Warwick-to-Ephrata Rail-Trail combines quite nicely with the Warwick Township Linear Park Trail to provide a pleasant, scenic hike with six breweries in good proximity to the route. 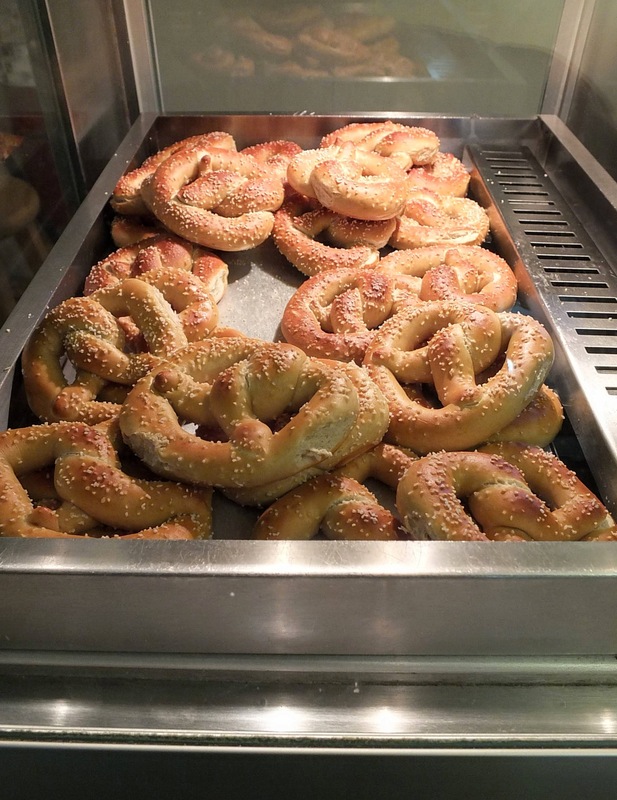 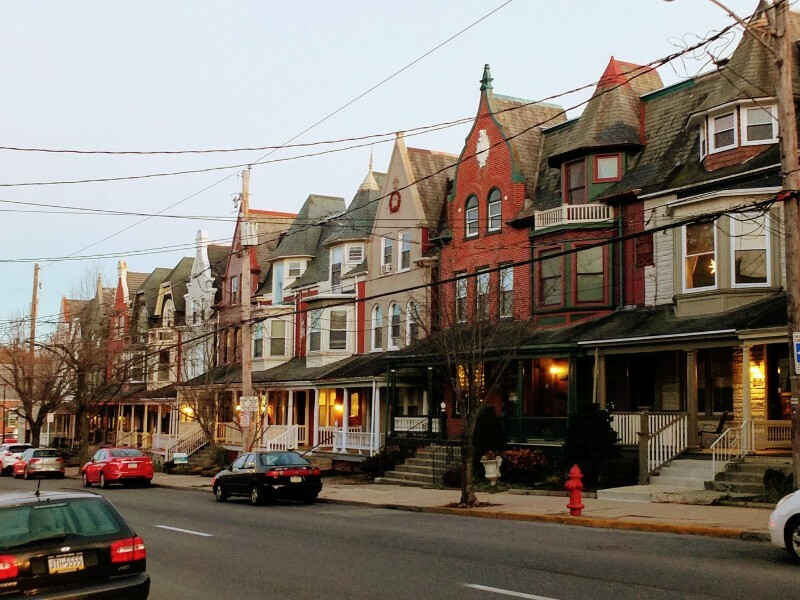 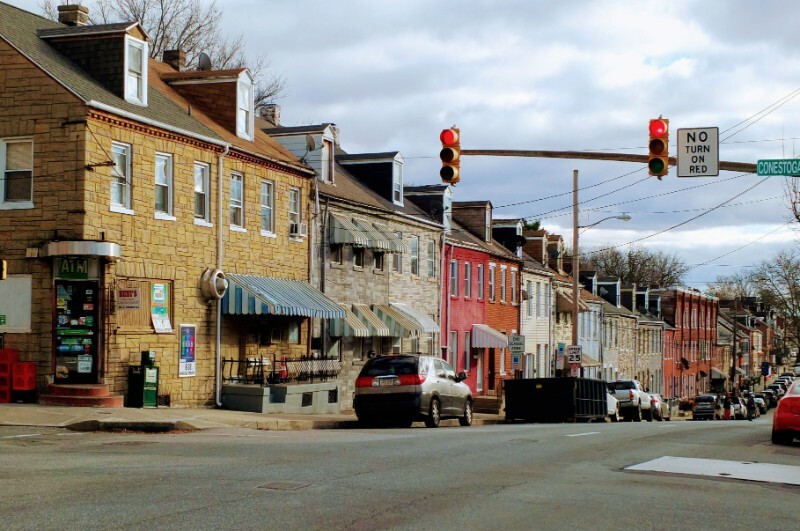 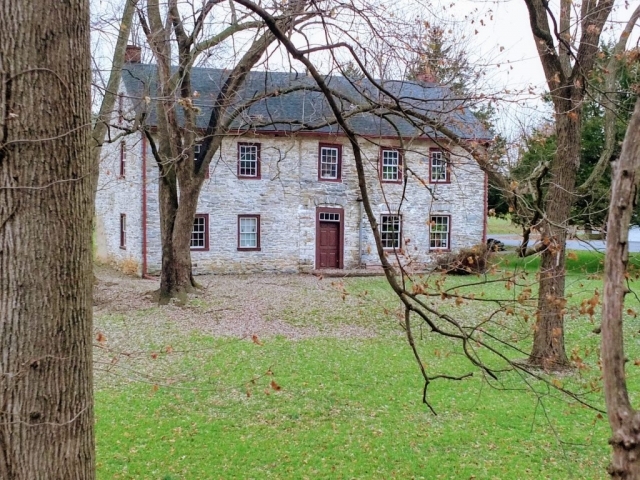 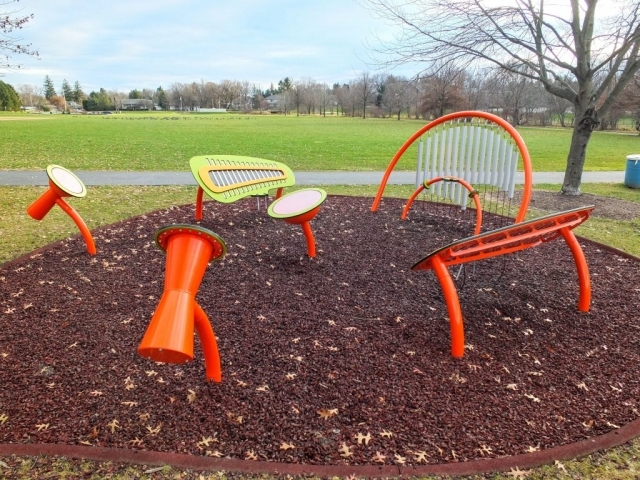 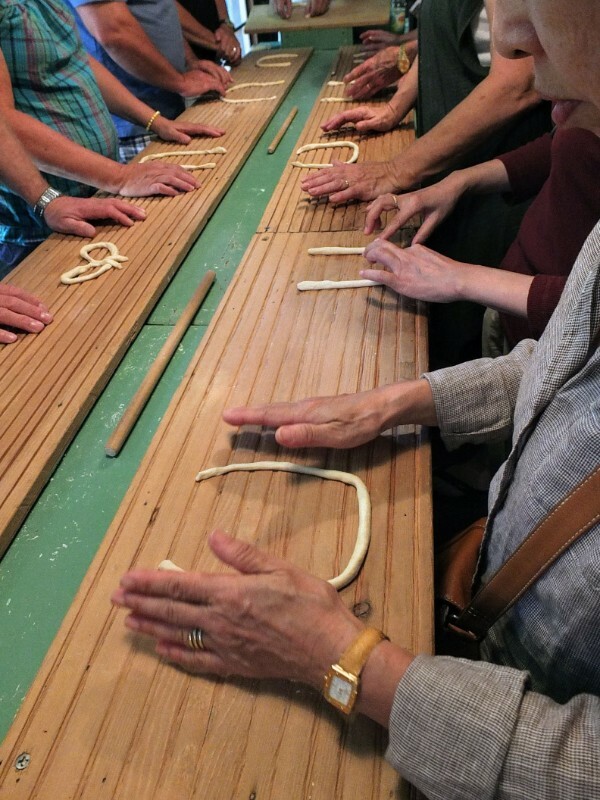 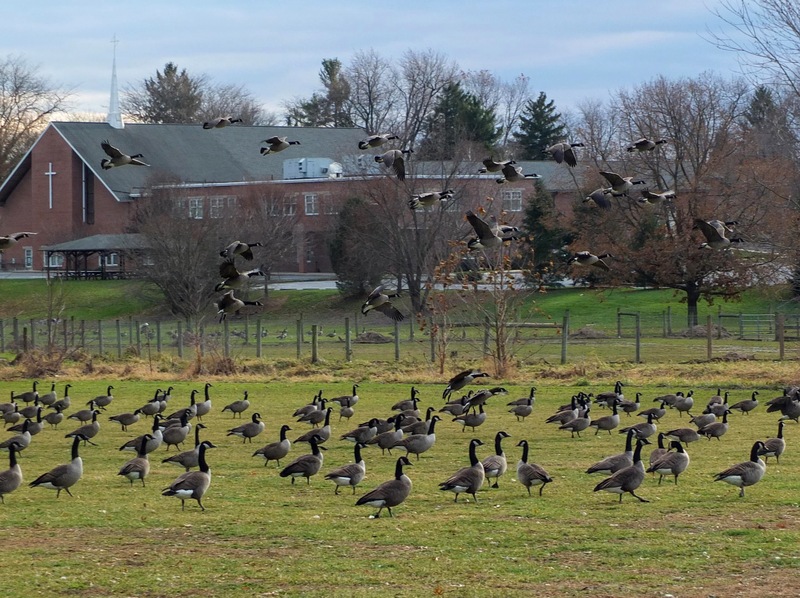 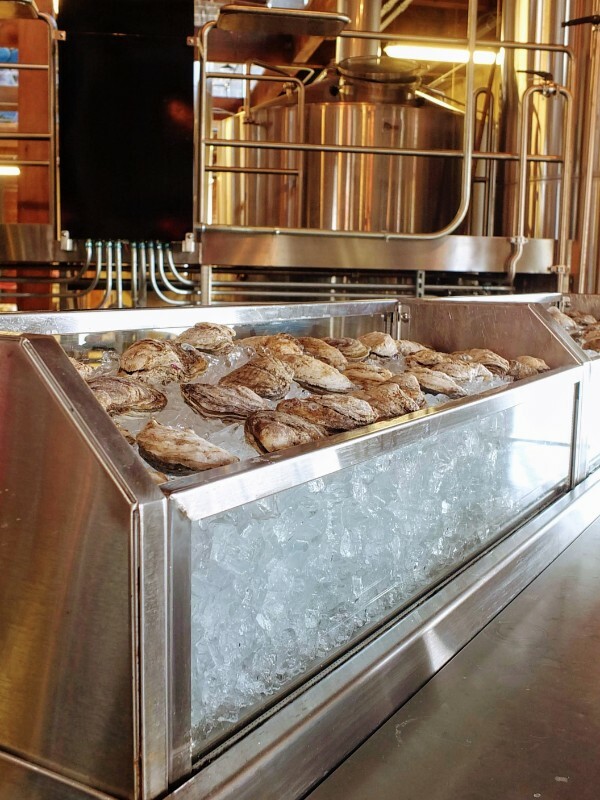 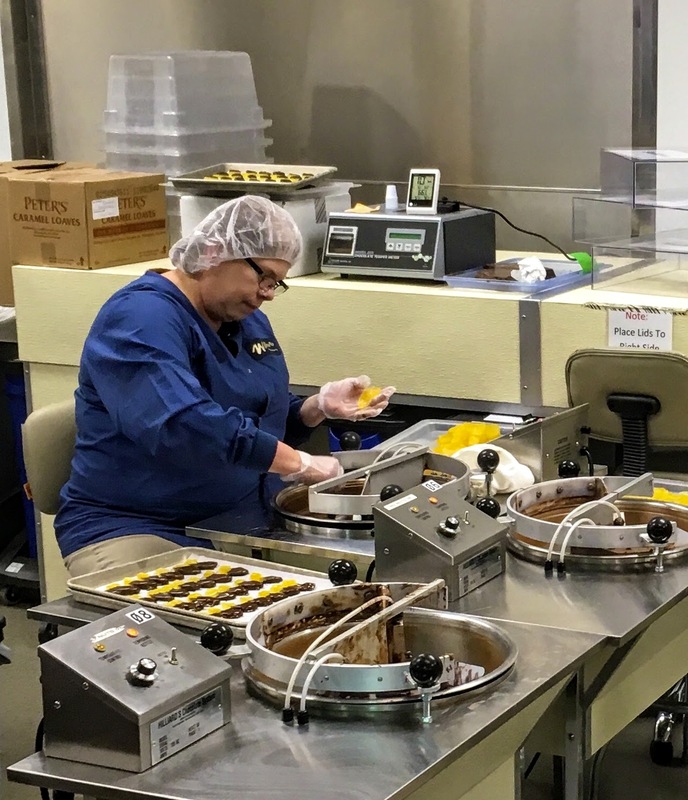 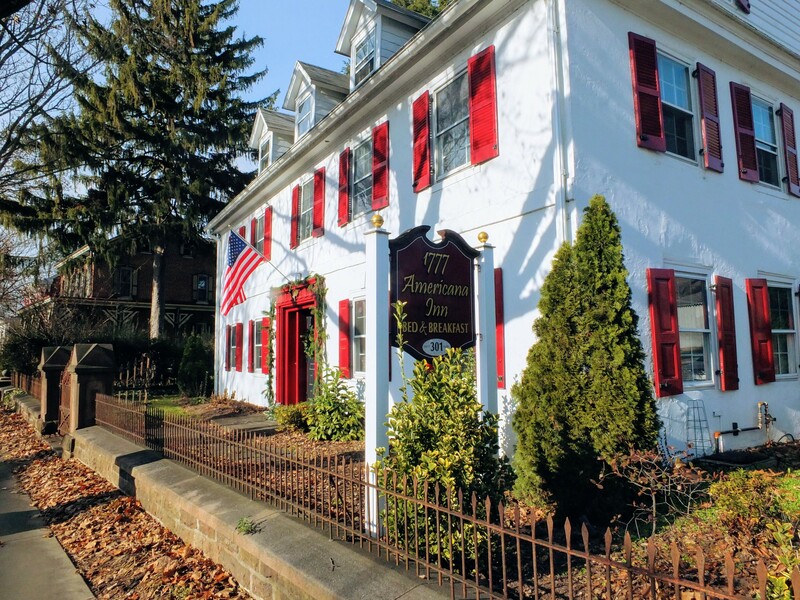 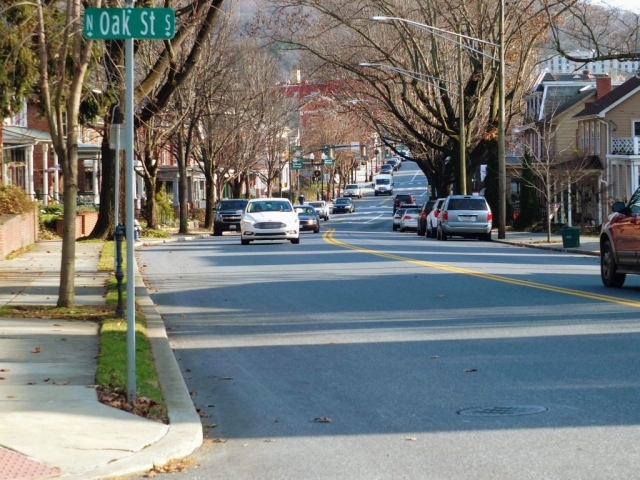 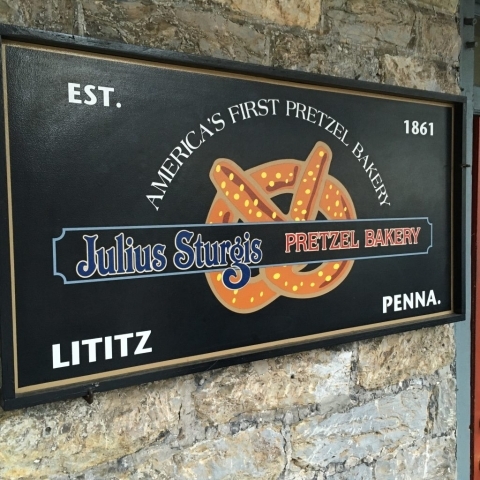 The old Moravian town of Lititz in the heart of Warwick Township anchors the western part of the hike and is home to three small brewery operations, America’s oldest pretzel factory, and a chocolate factory. 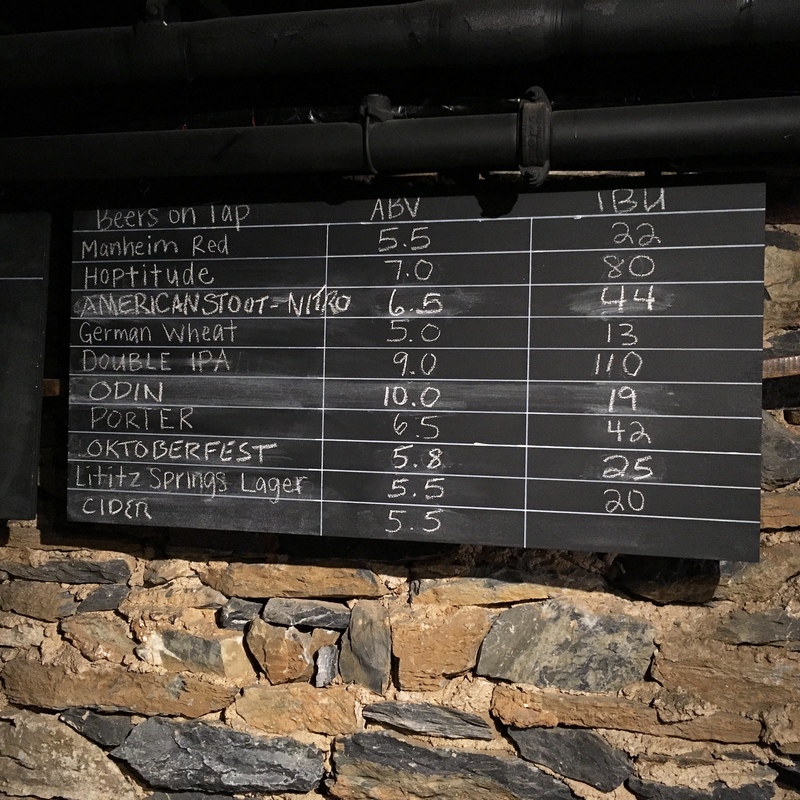 As I understand it, the Moravians here favored beer as a favorable alternative to harder drink. 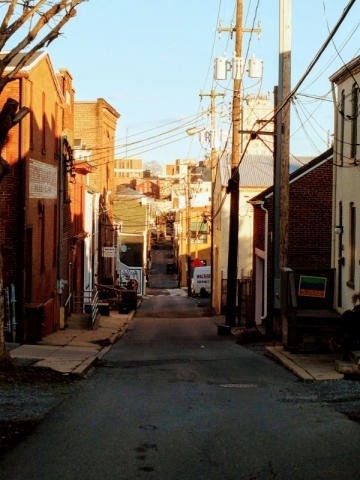 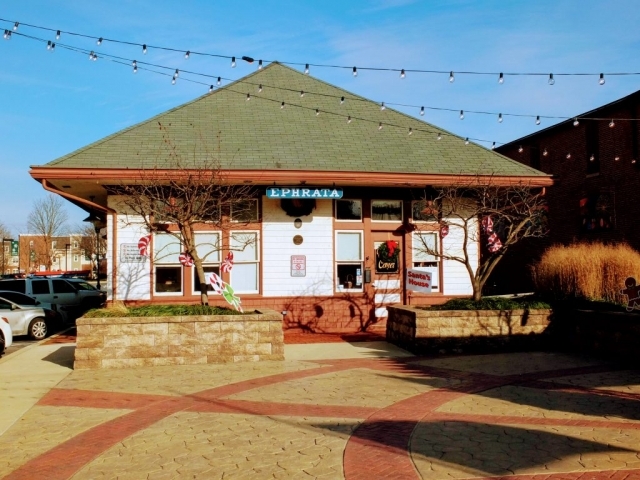 The old cloister town of Ephrata on the east end also is home to three small brewery operations. 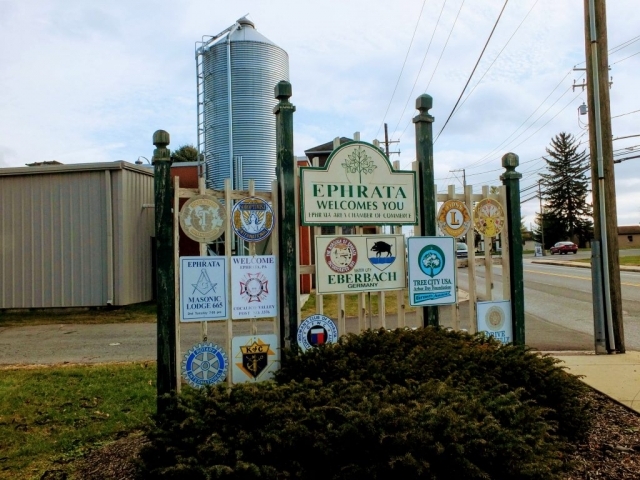 I was staying in Lititz, so I got a lift to Ephrata in order to hike from east to west. 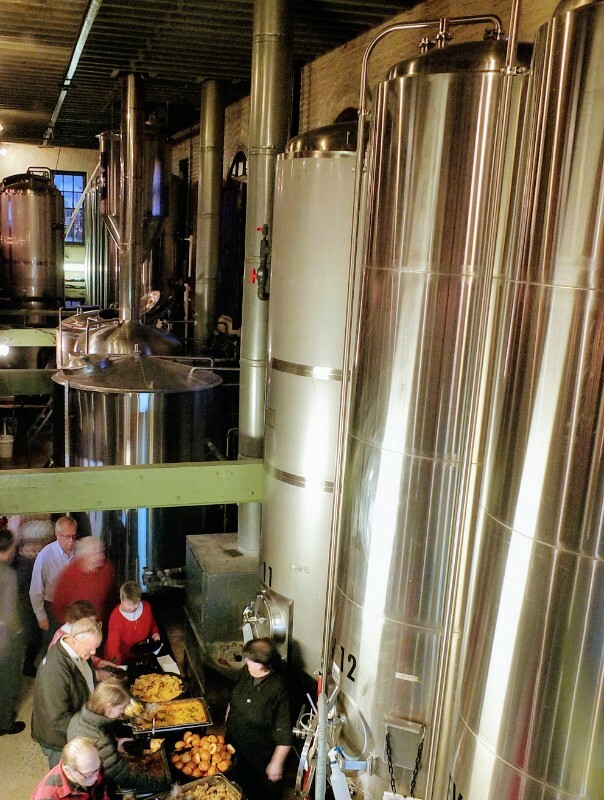 The brewery scene in this area struck me as kind of early-stage. 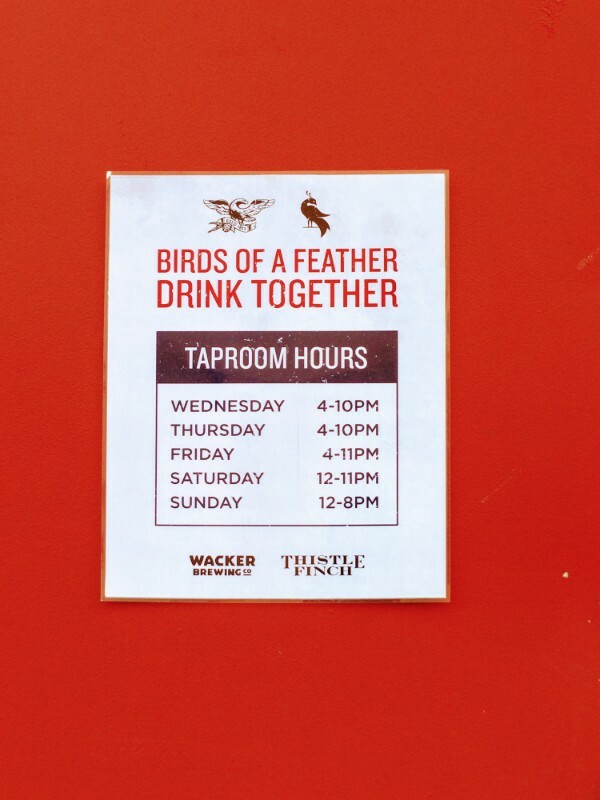 It was tough to pick a day/time to find all of the places open – hours of operation seemed limited. Several of the places were fairly new and were side businesses for the proprietors. 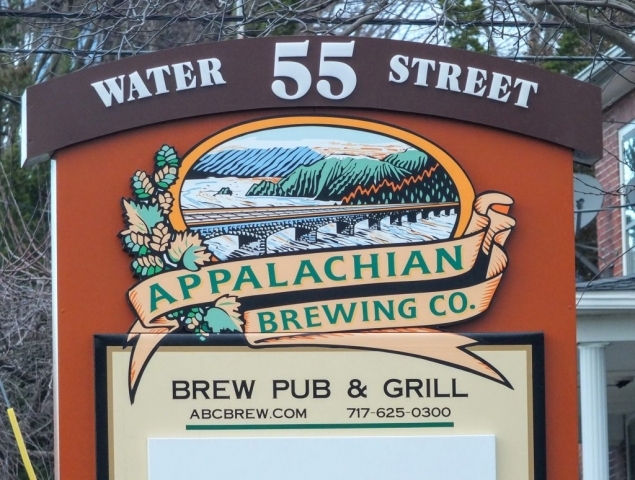 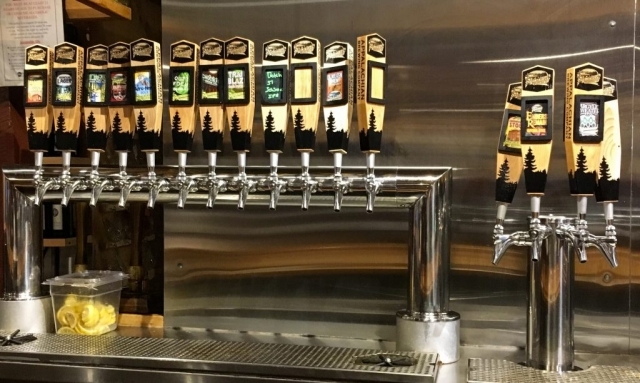 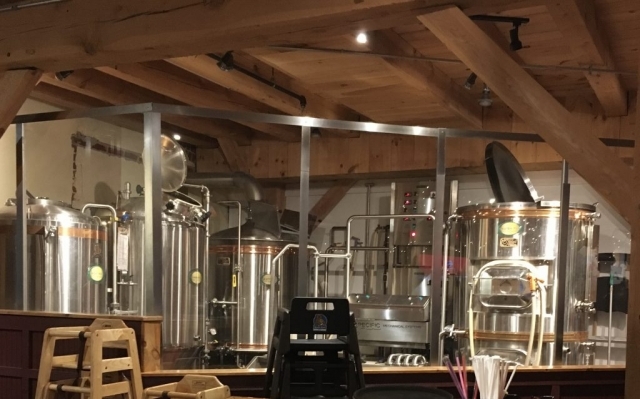 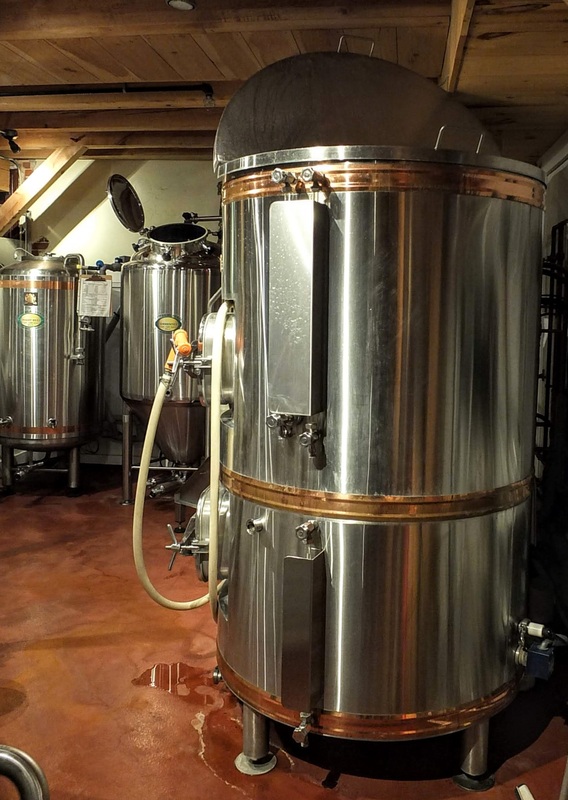 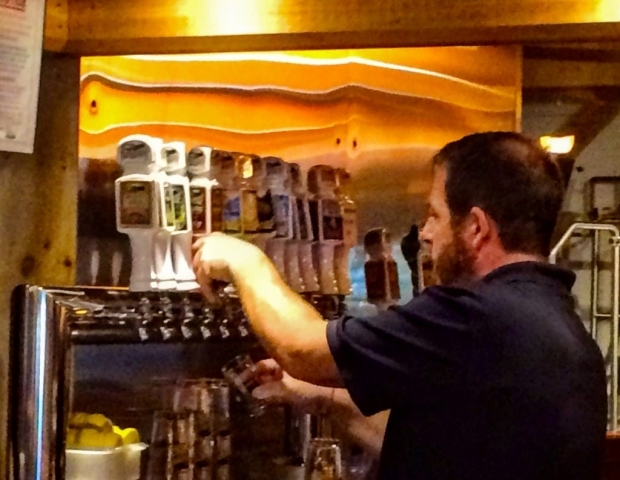 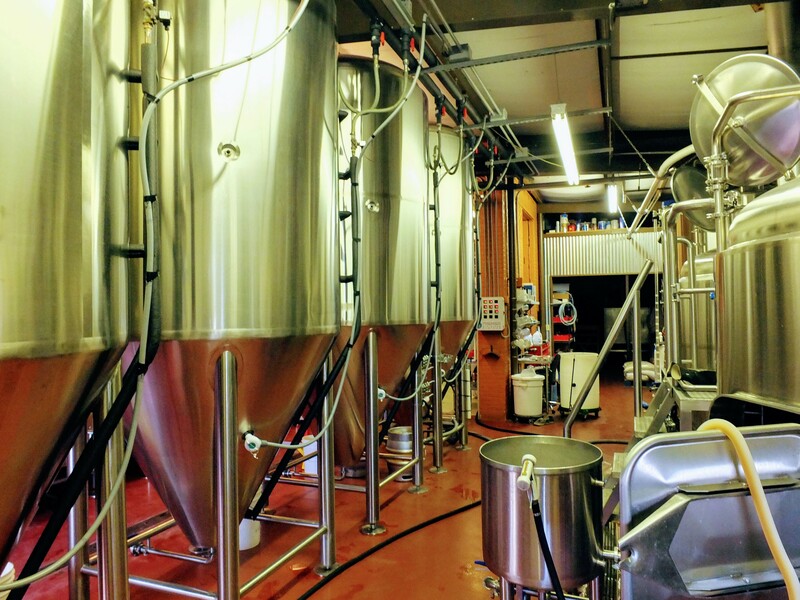 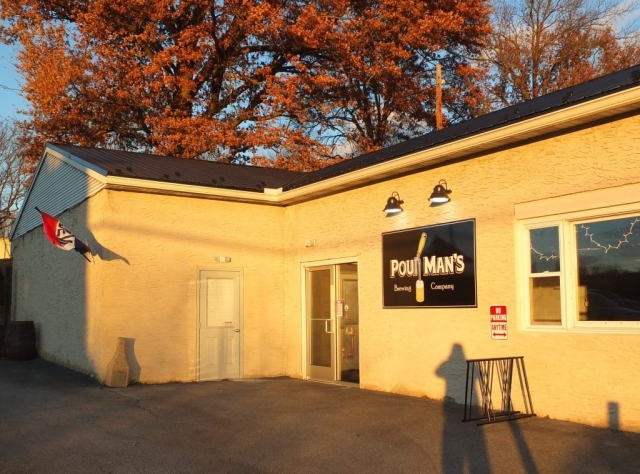 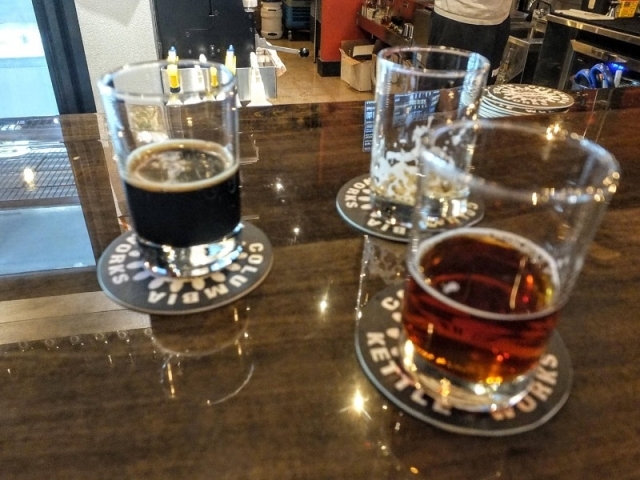 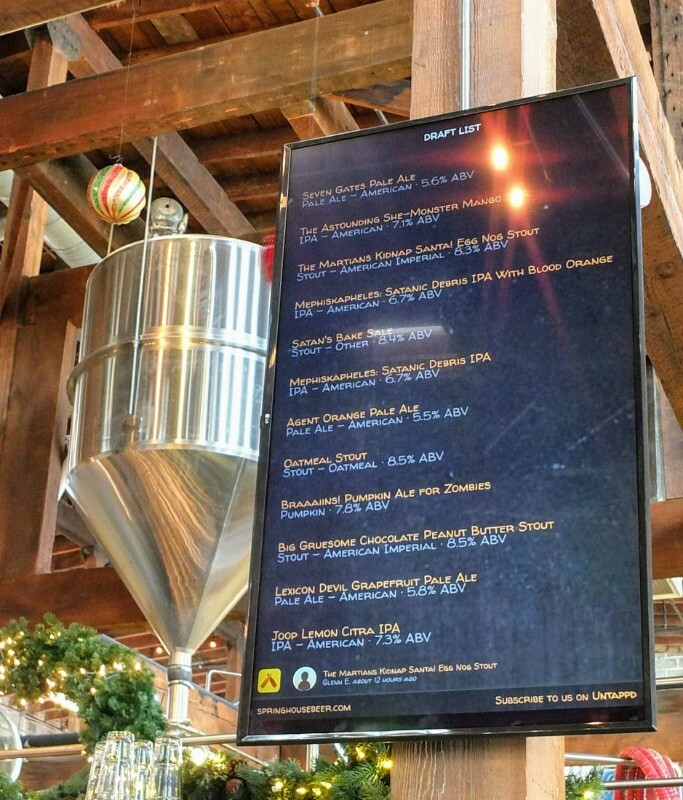 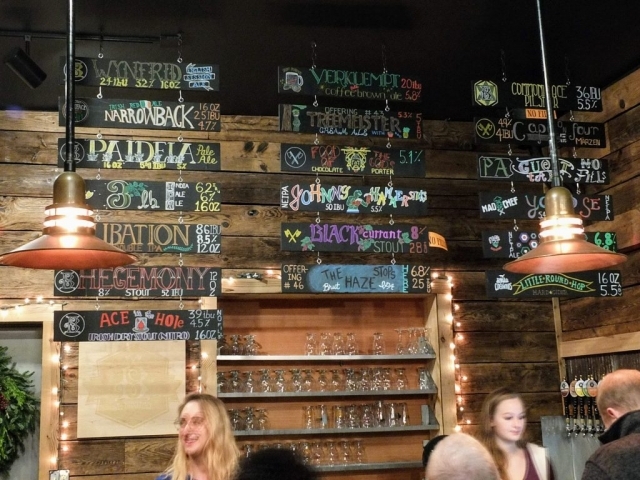 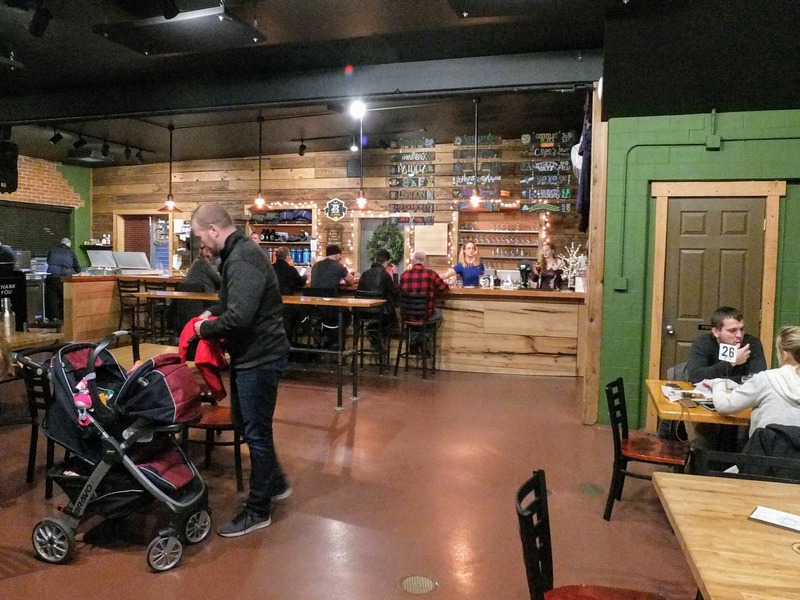 I got the sense that regulations governing breweries in Pennsylvania have held up development of breweries here compared to in other jurisdictions and that the regulatory environment here is still evolving. 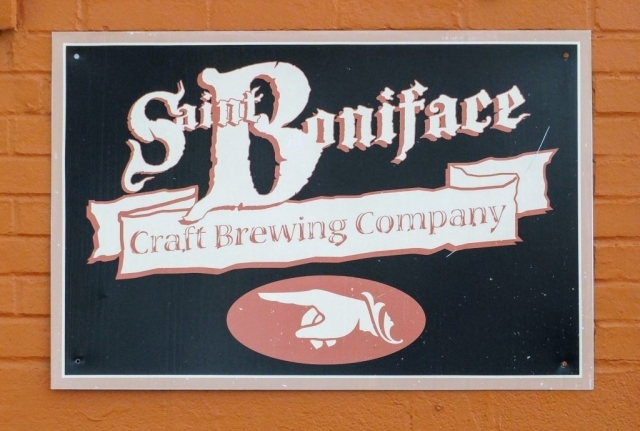 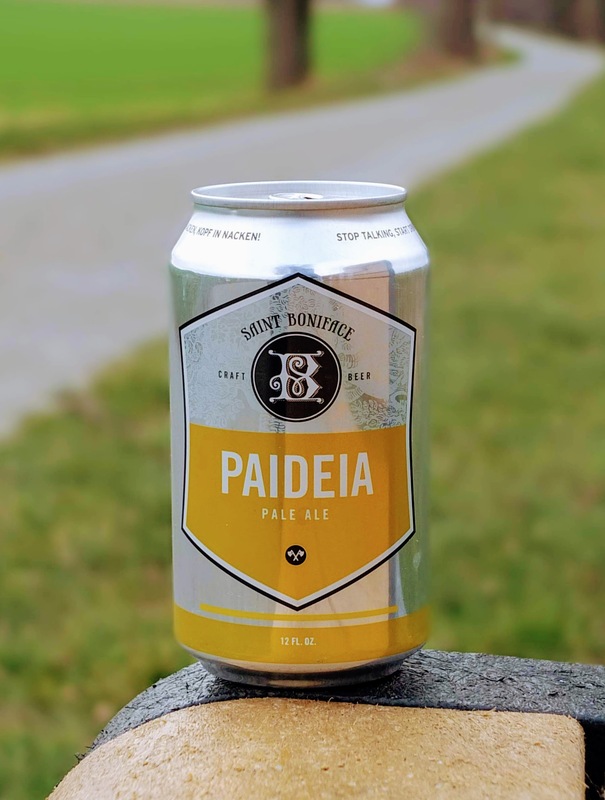 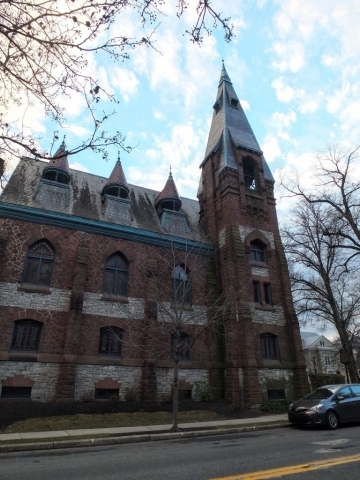 St. Boniface and Appalachian (a multi-location brewery in the region) were more established operations while Fetish and Pour Man’s are small but friendly operations that were hard to catch when open. 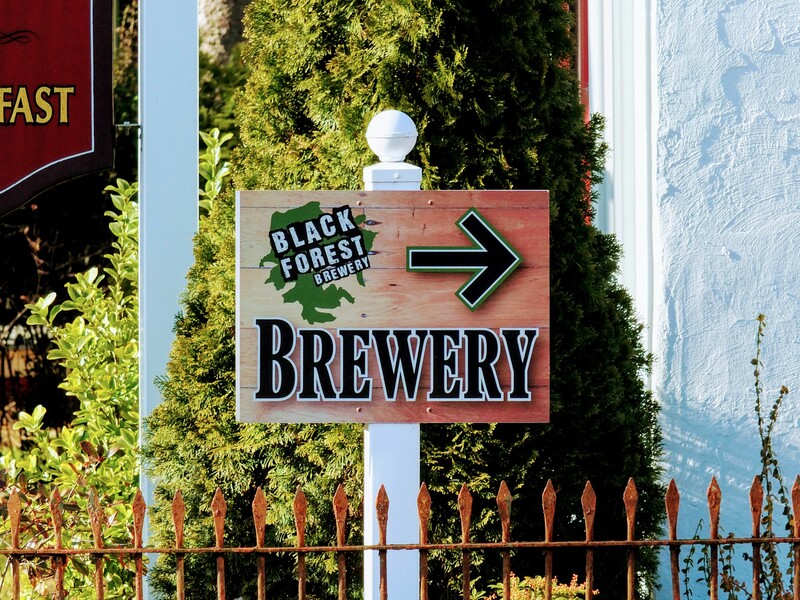 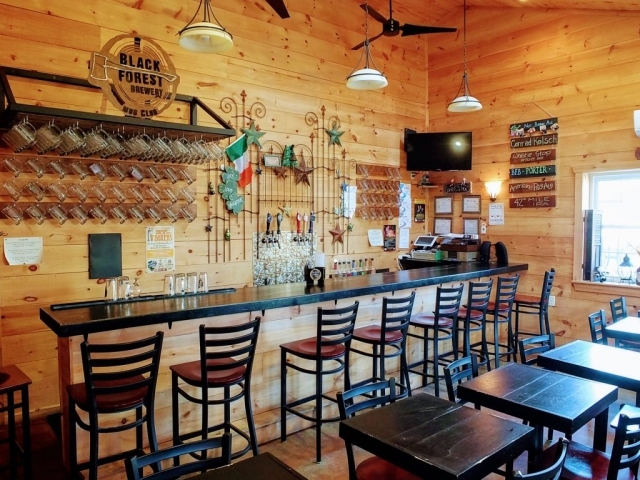 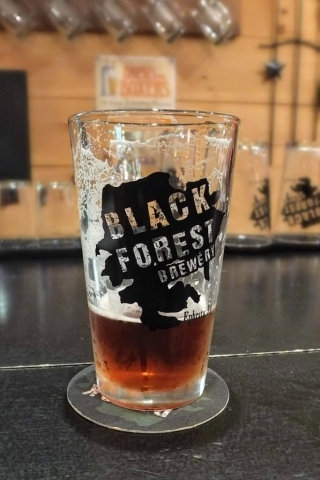 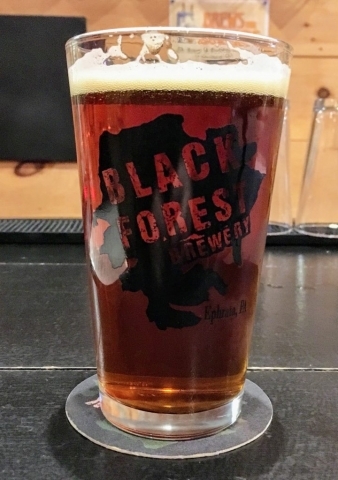 Black Forest is a unique bed & breakfast with brewery combination that I imagine could be a good place to base out of if I weren’t staying with relatives. 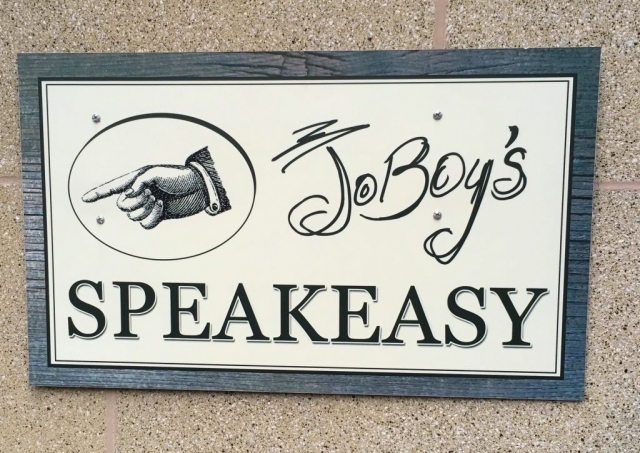 JoBoy’s is a brew pub located in a historic building called Rudy’s Hall that has long served as a community meeting place. 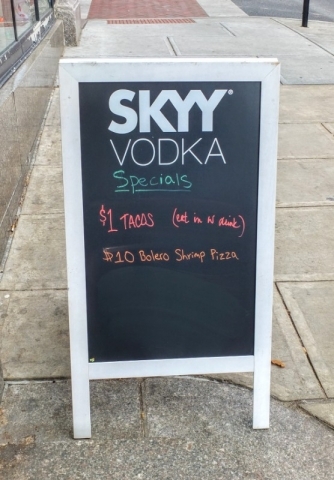 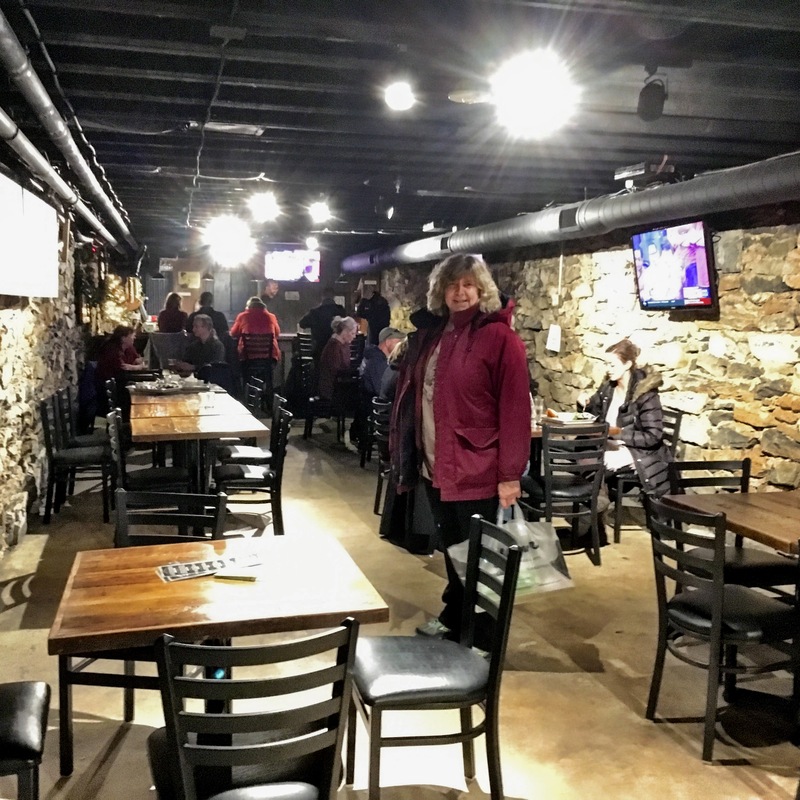 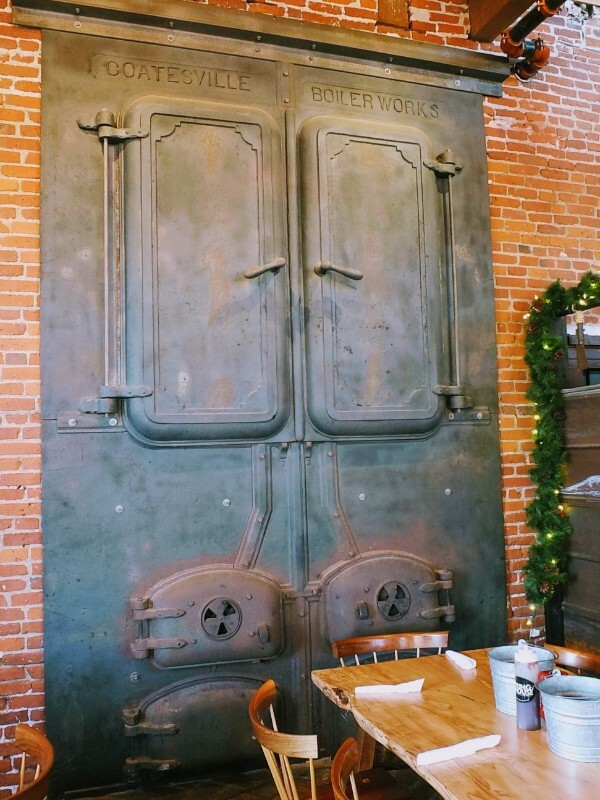 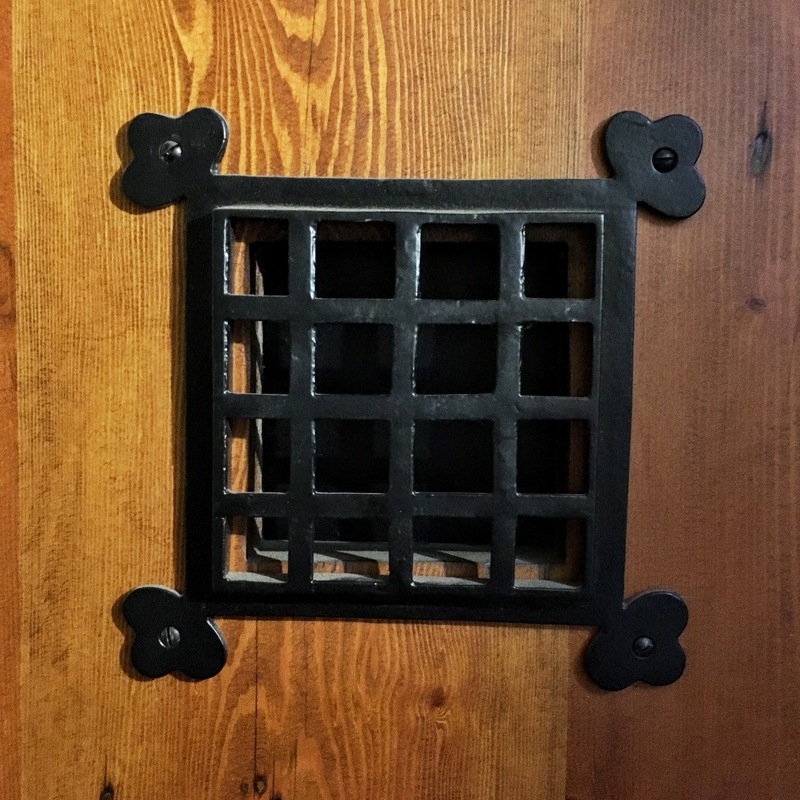 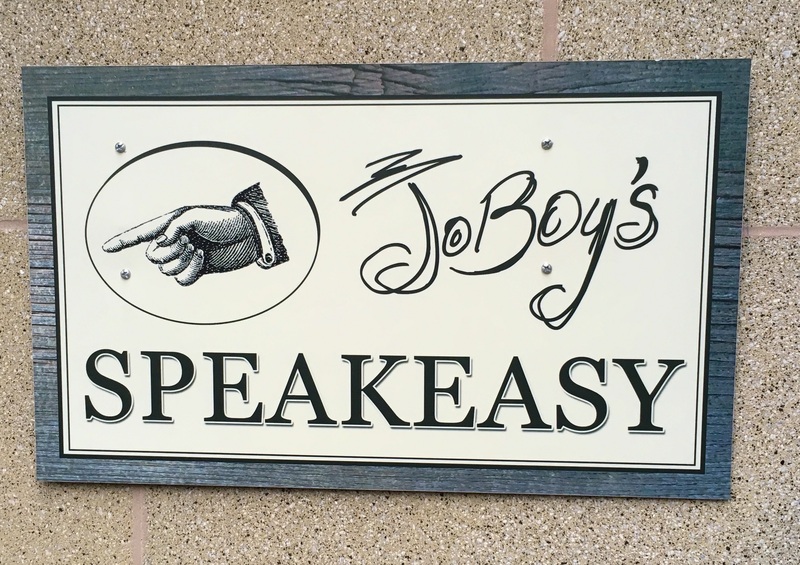 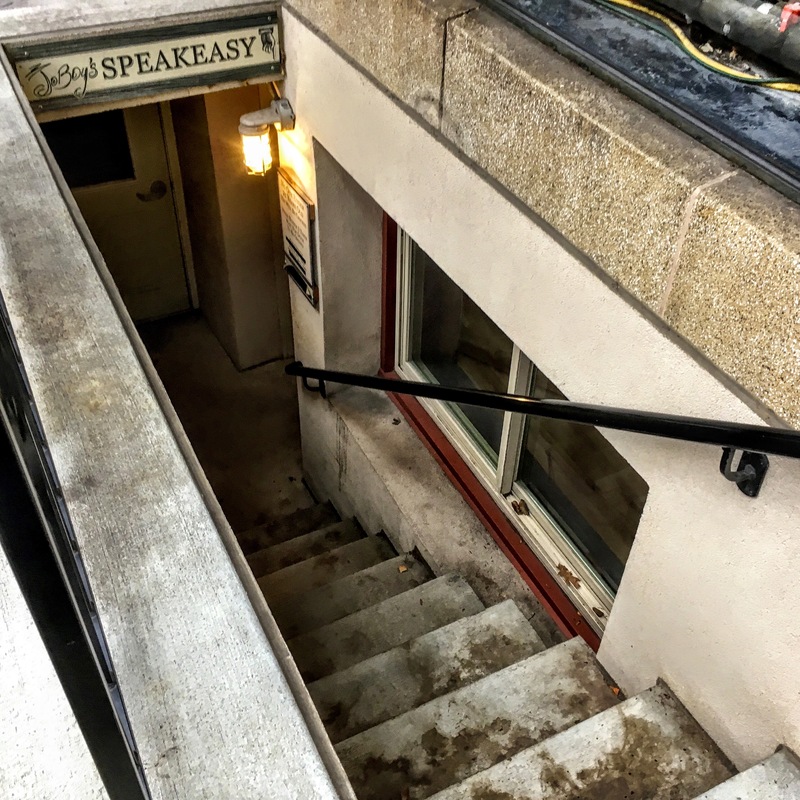 We happened to be there on the anniversary of the end of prohibition so it was a natural to stop into their basement Speakeasy – a sign invites customers to “knock loud 3 times wait for the door to be opened.” There is a small hatch on the entrance door as you would expect. There is even a password. 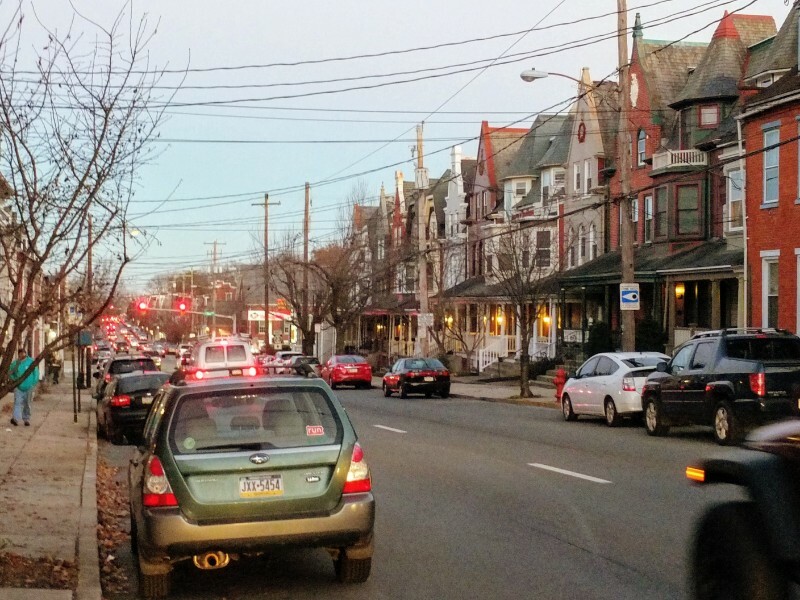 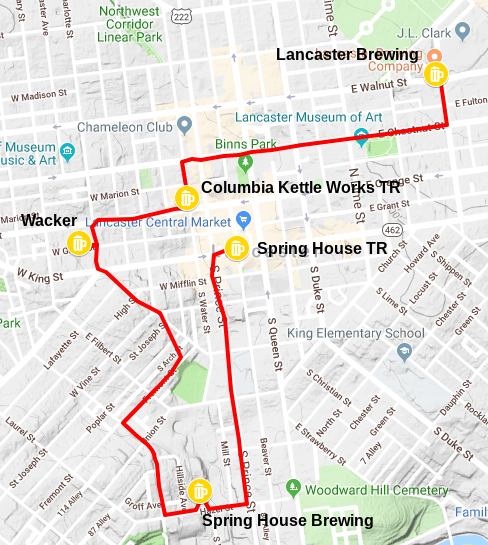 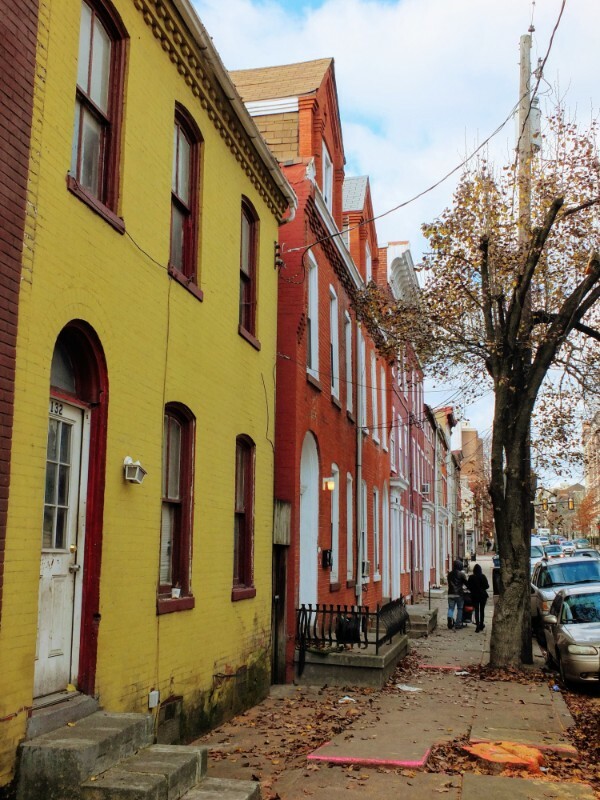 Lancaster is a fairly sizable urban area with an historic core, so a downtown tap room/brewery walk was a natural. 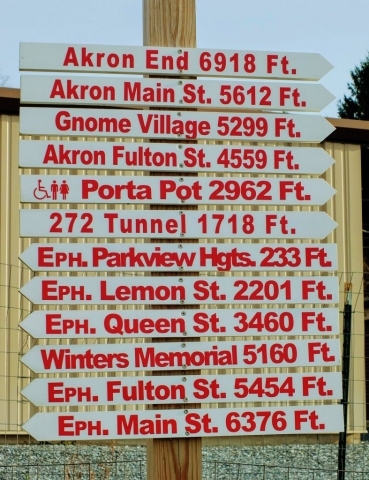 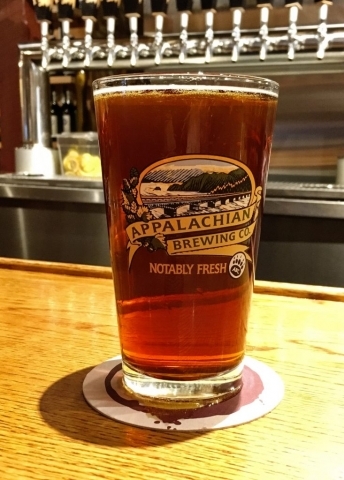 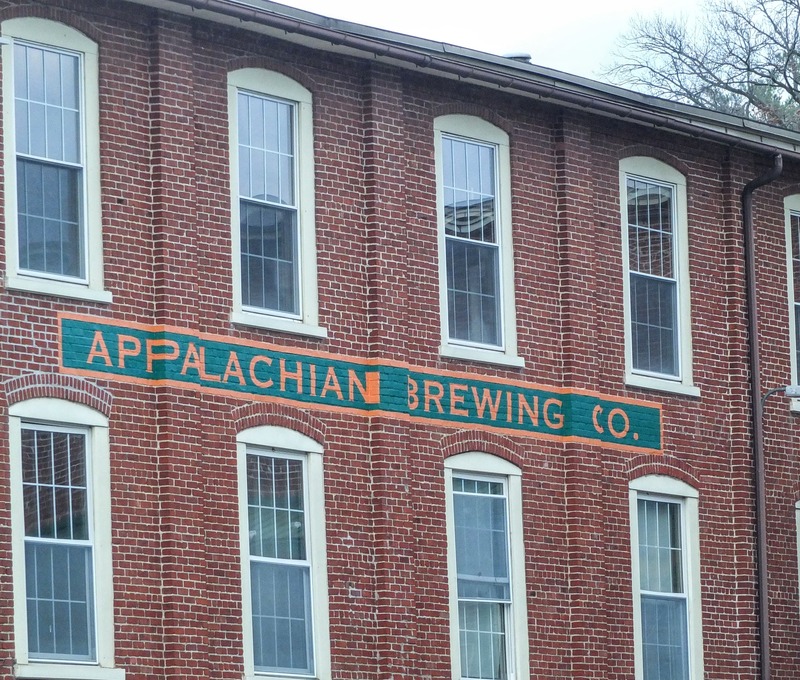 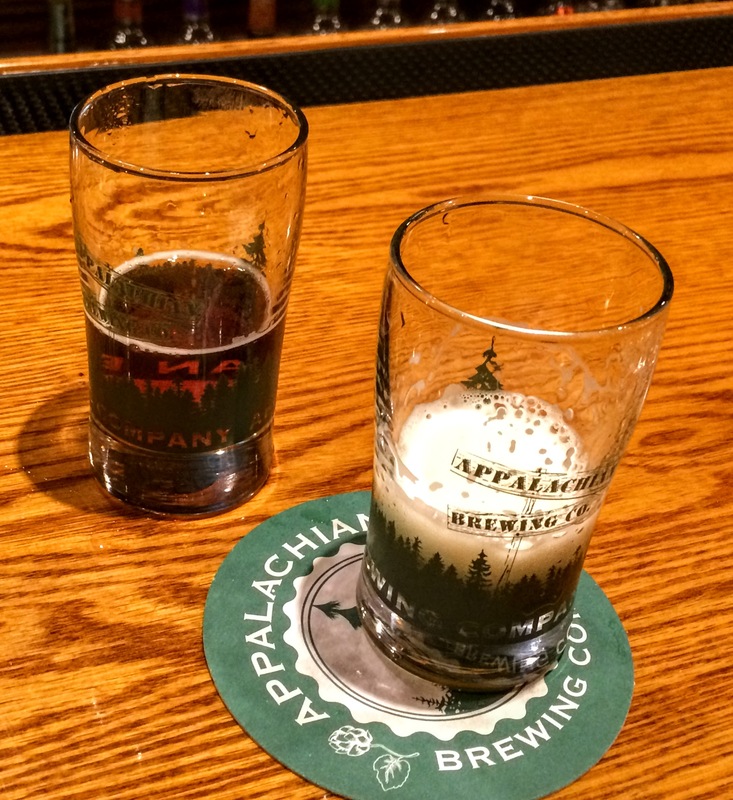 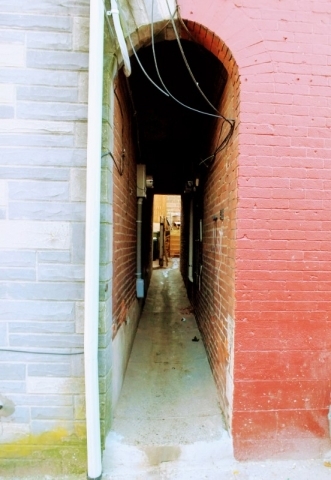 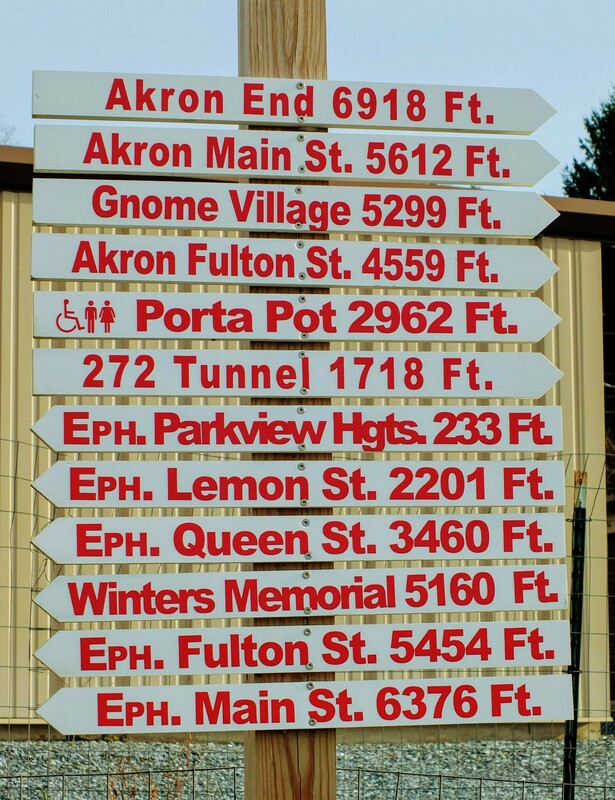 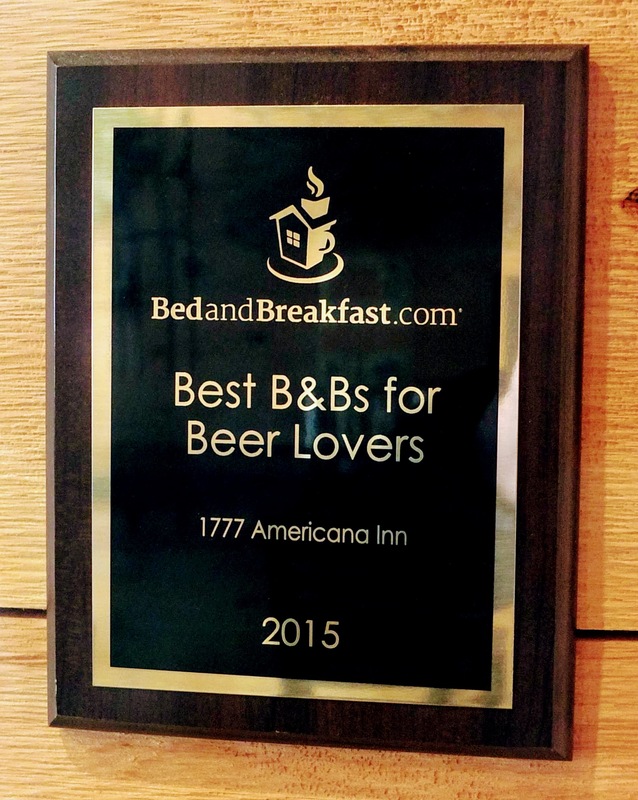 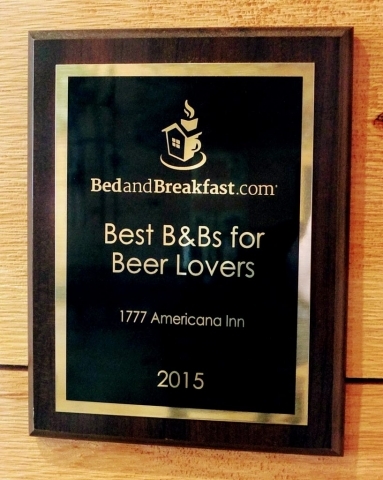 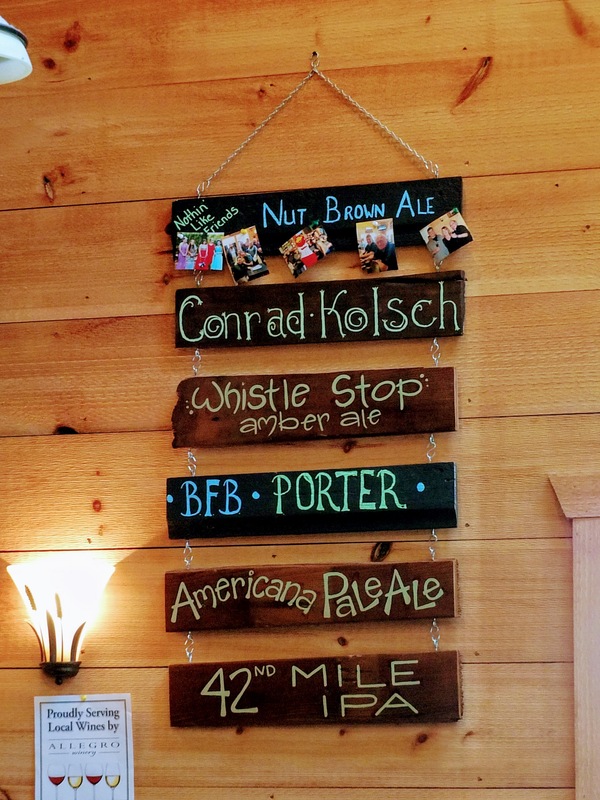 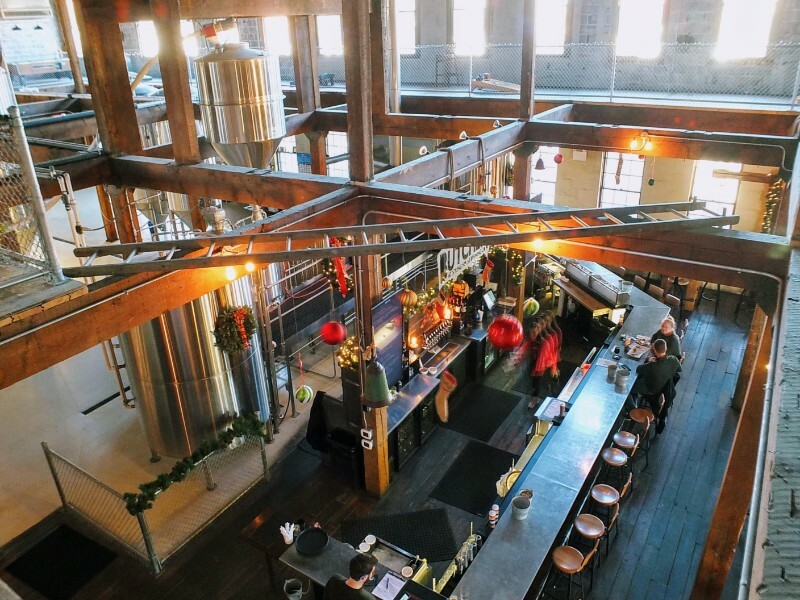 Three breweries and the tap room of a fourth are found along the way. 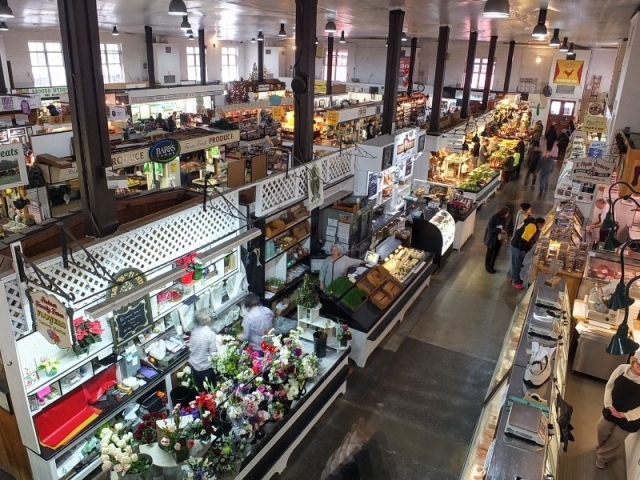 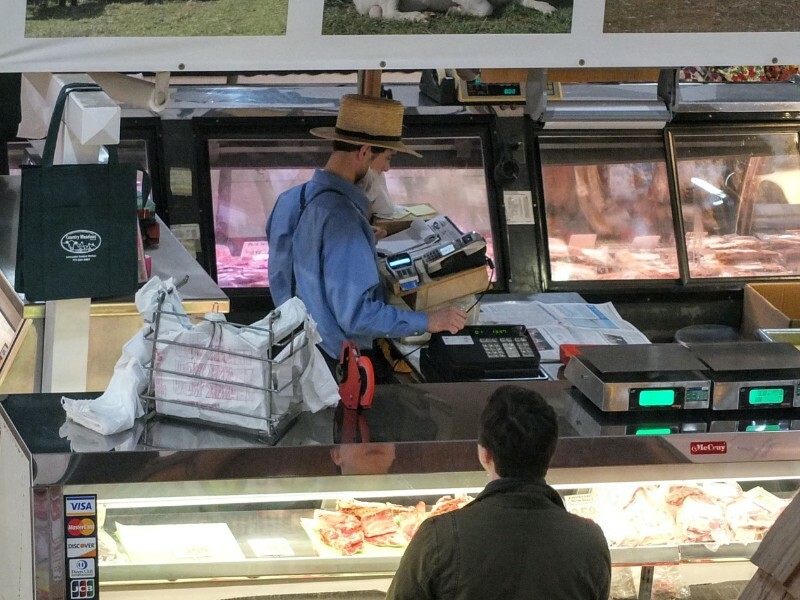 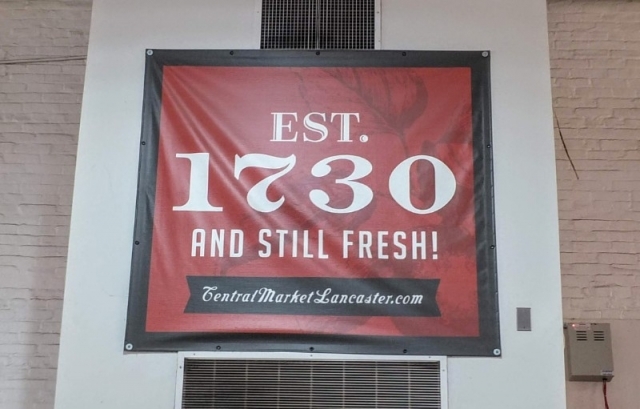 A stop at the historic Lancaster Central Market was my starting point. 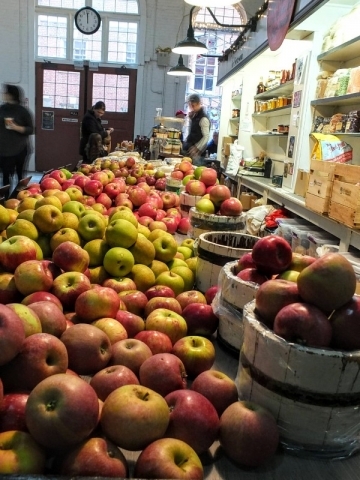 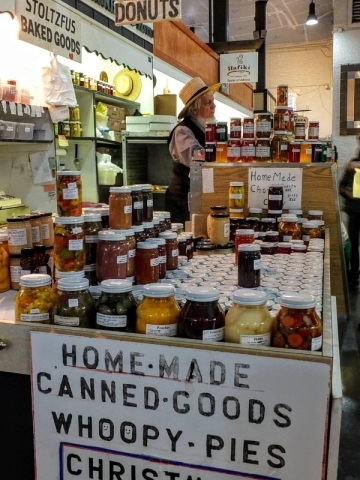 This is a cool, old school market with a great variety of local baked goods, canned goods, meats, produce, and crafts. 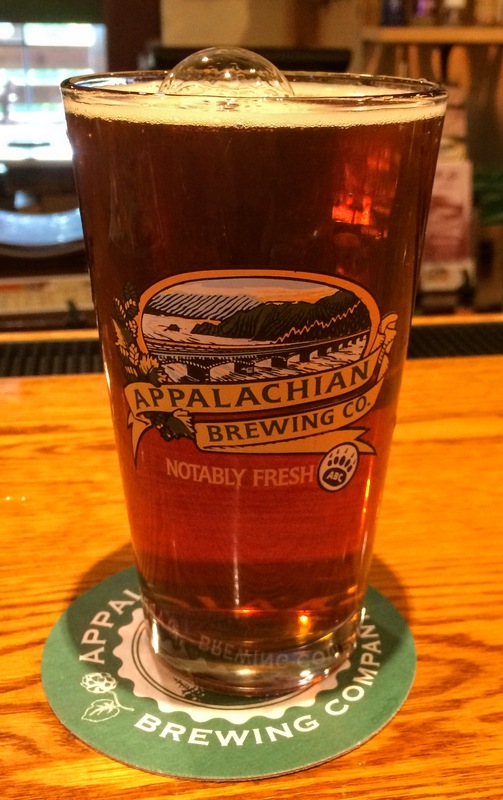 Just a few steps away is a taproom. 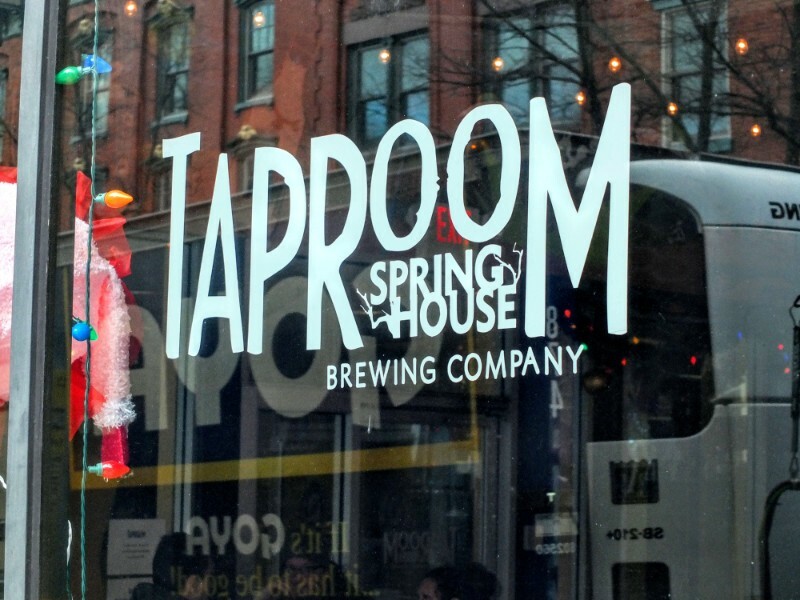 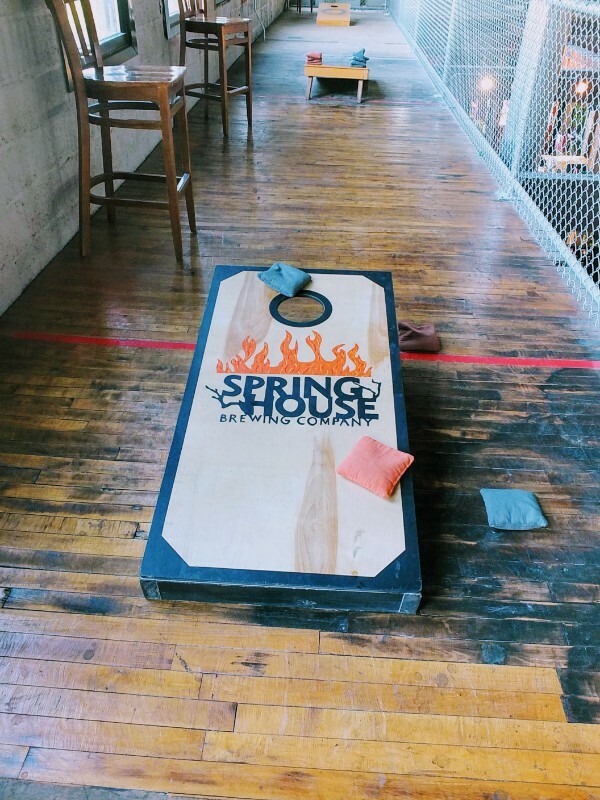 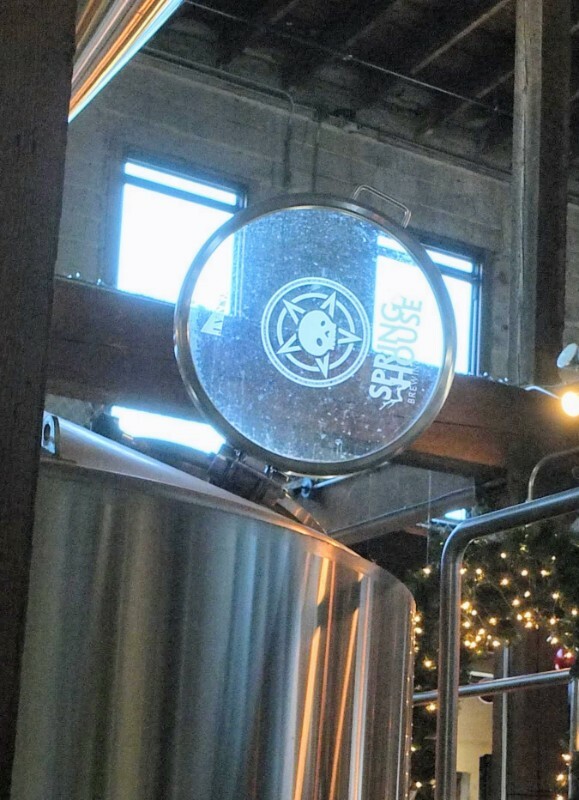 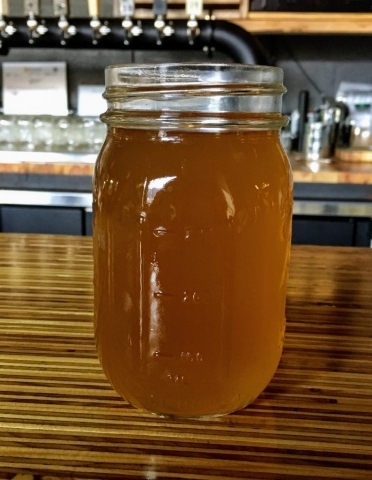 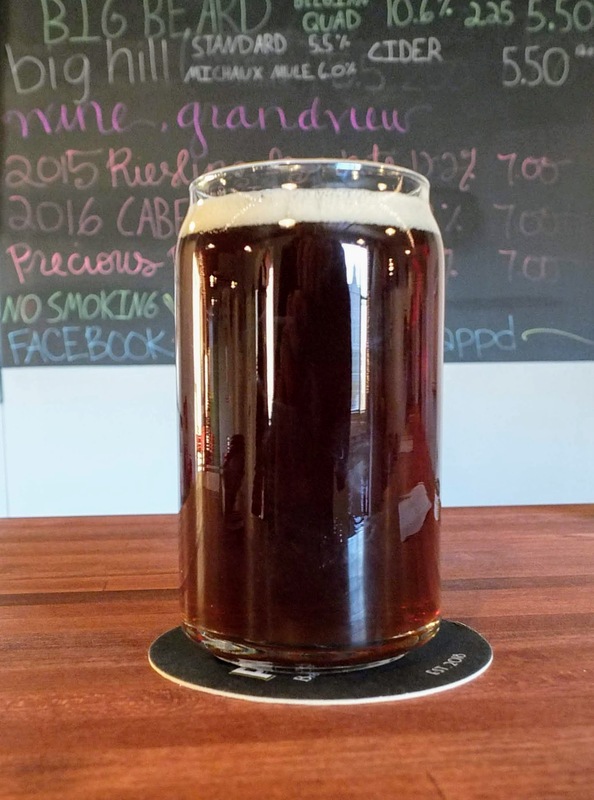 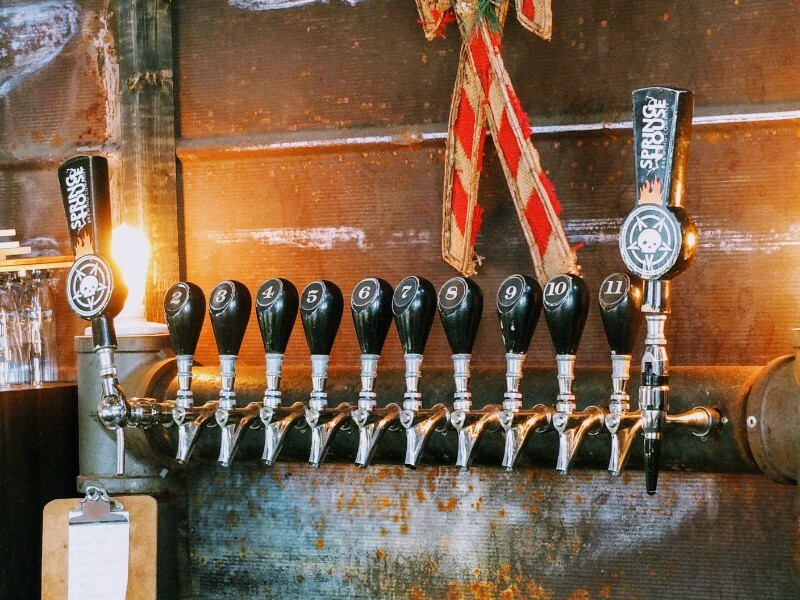 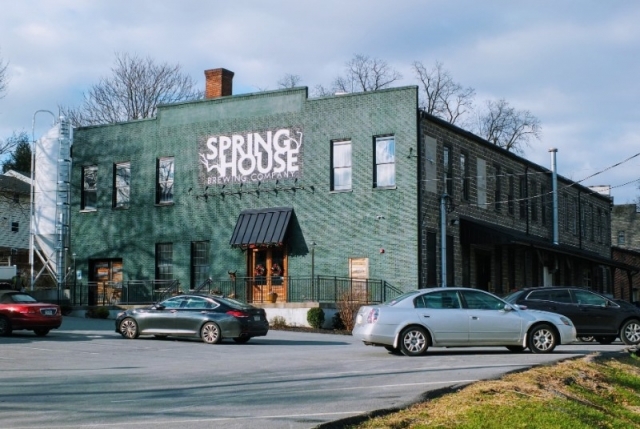 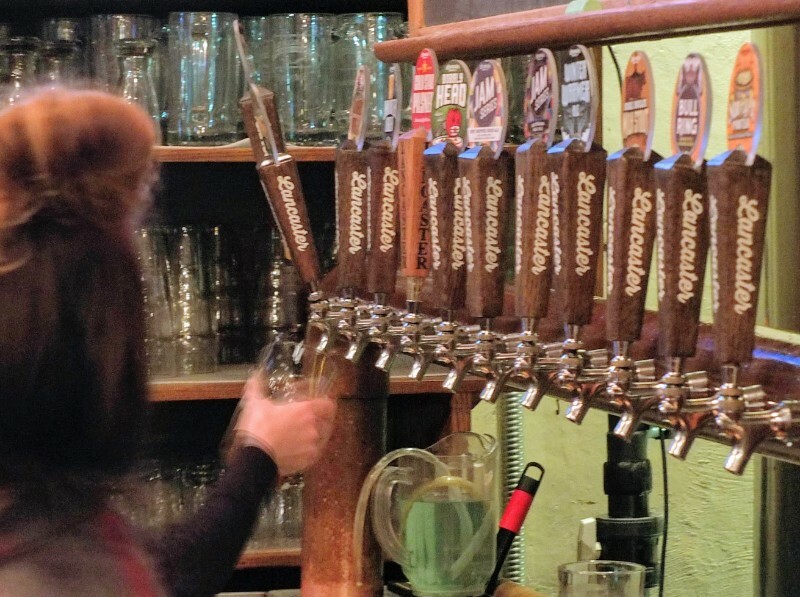 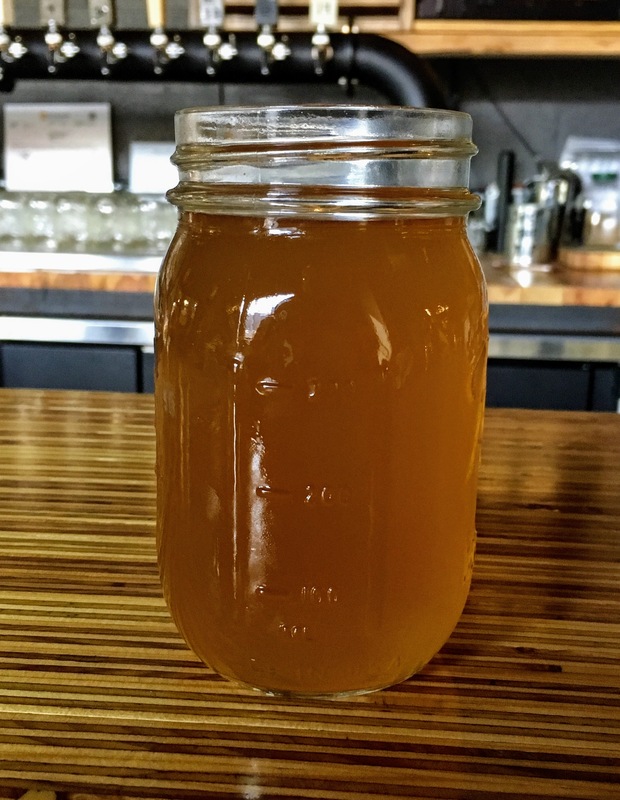 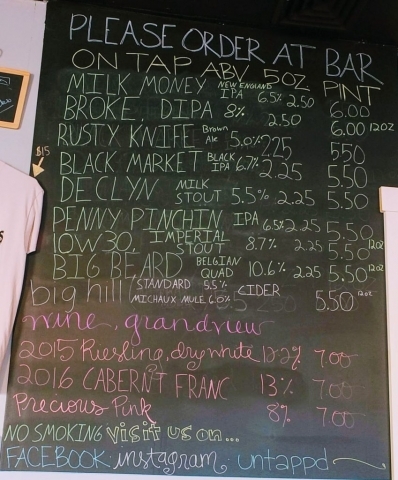 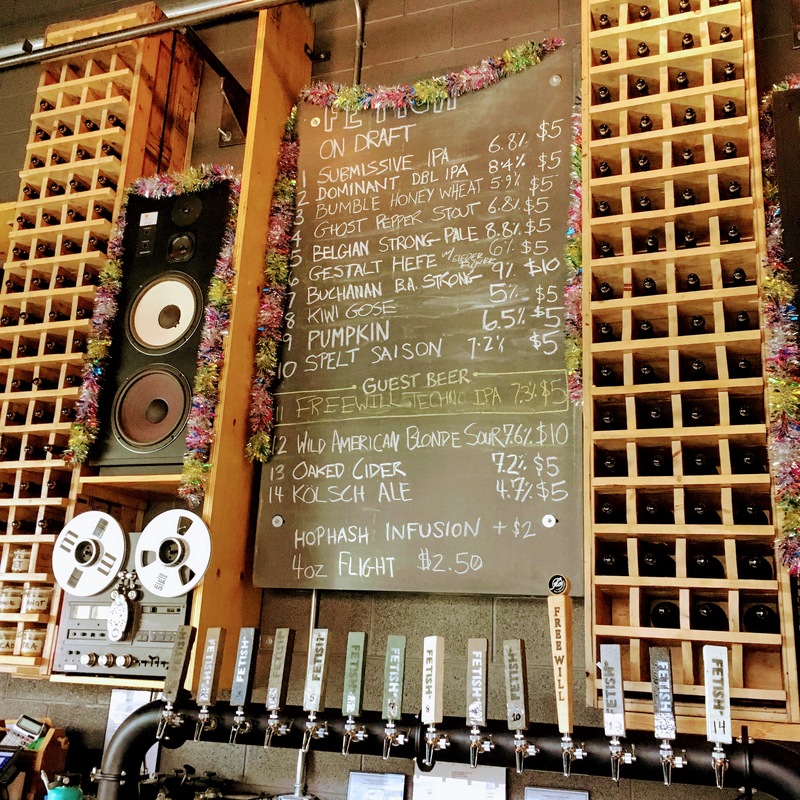 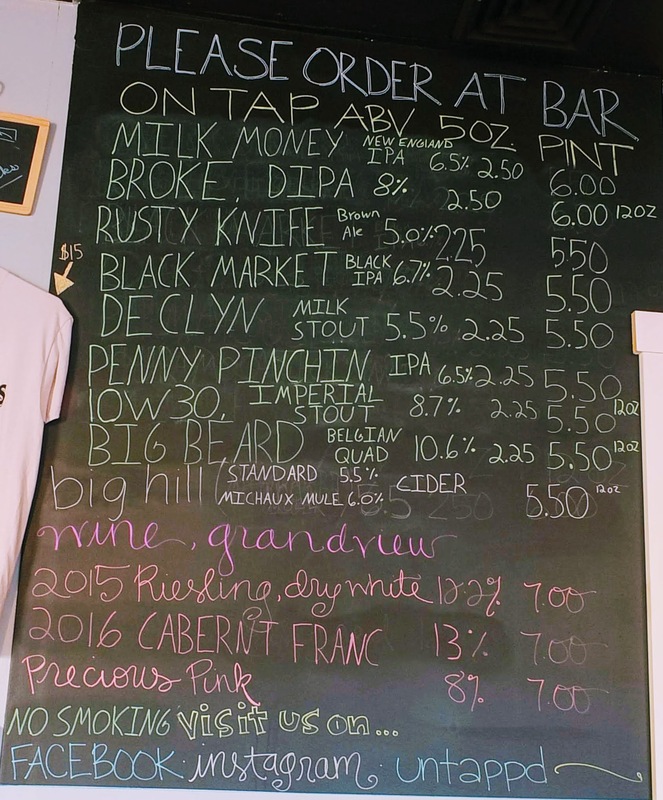 Spring House Brewing has both a taproom and their brewery along the way. 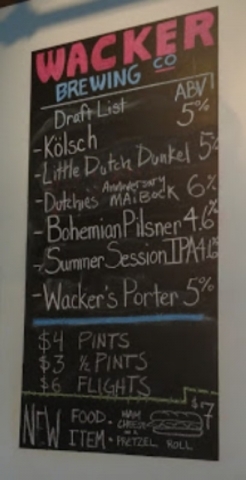 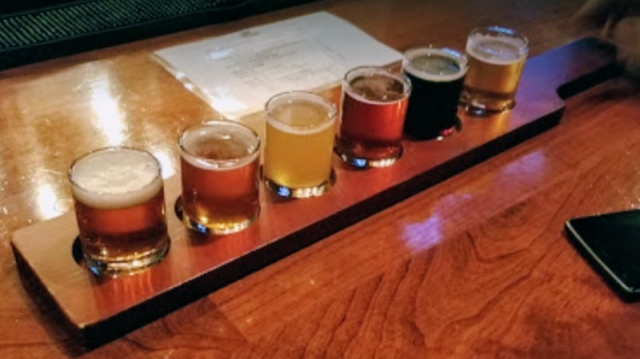 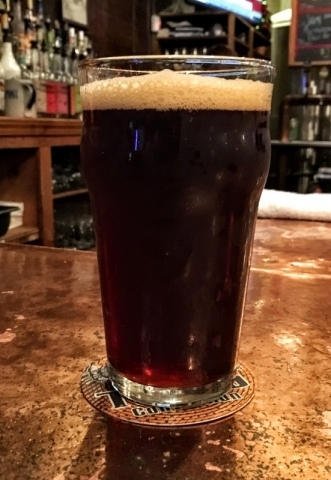 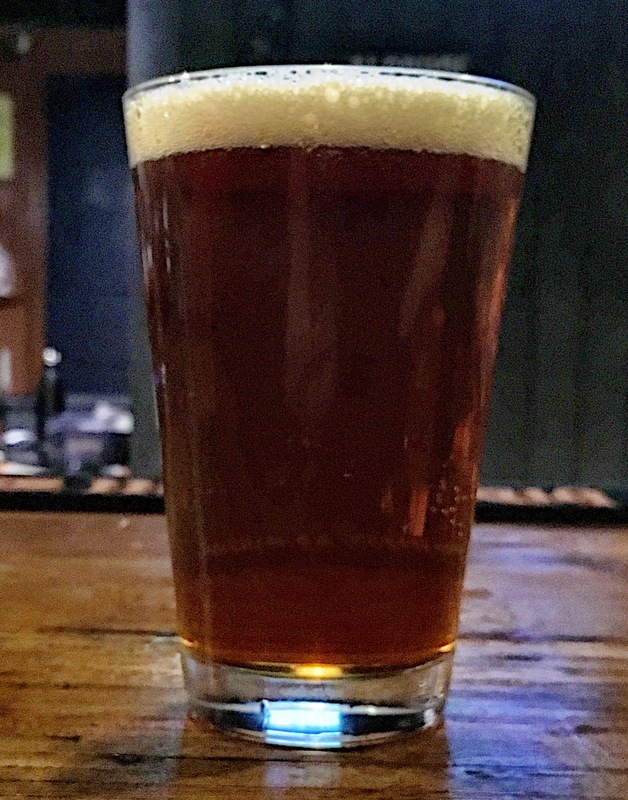 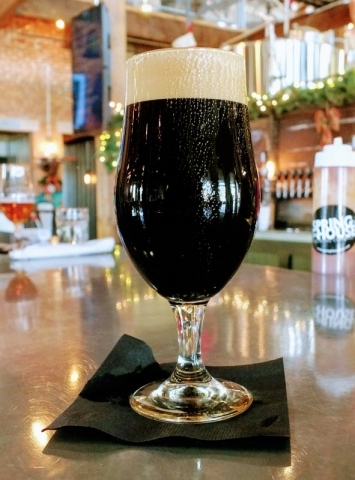 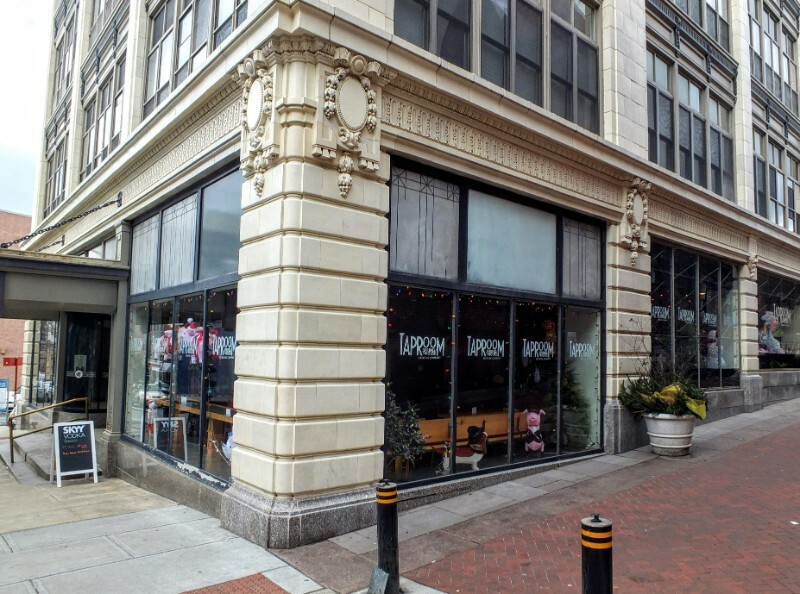 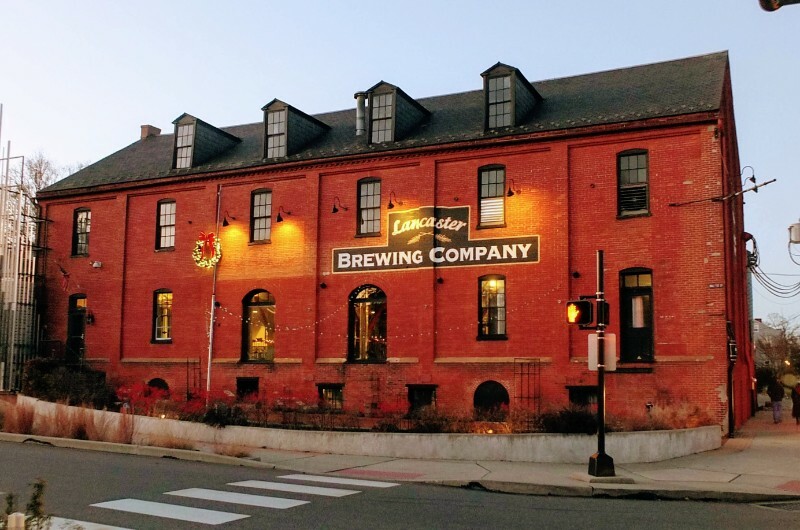 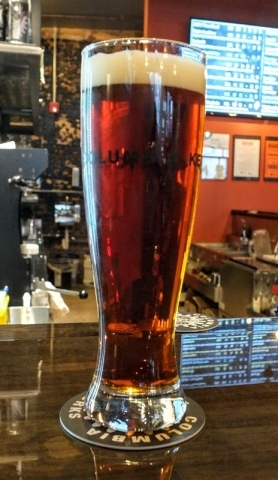 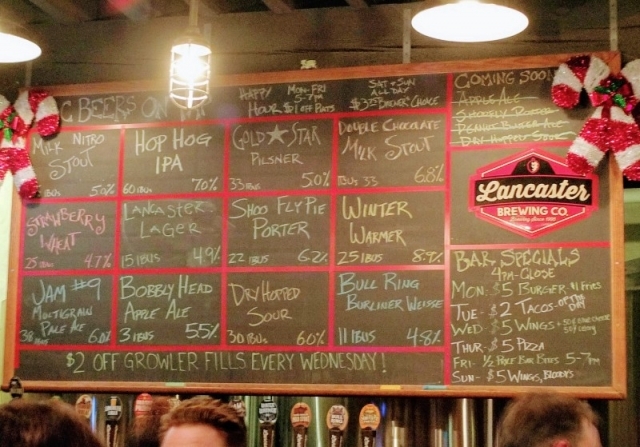 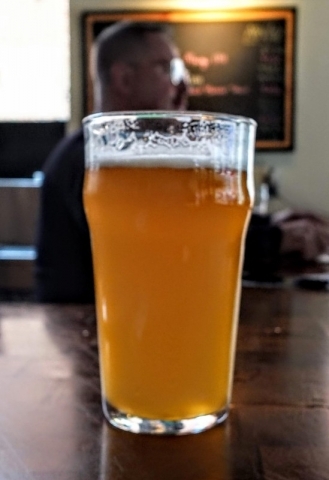 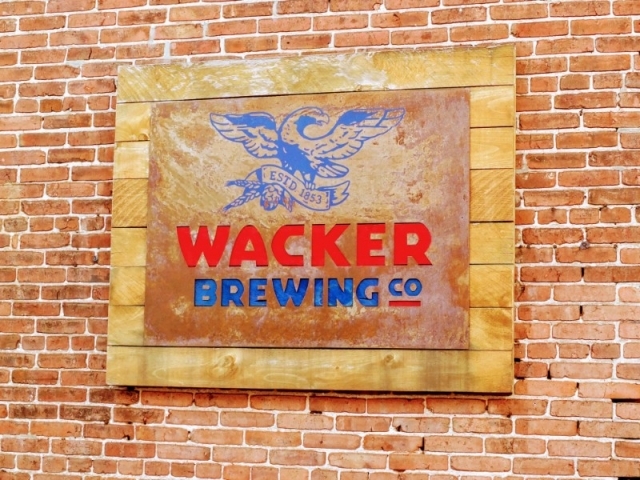 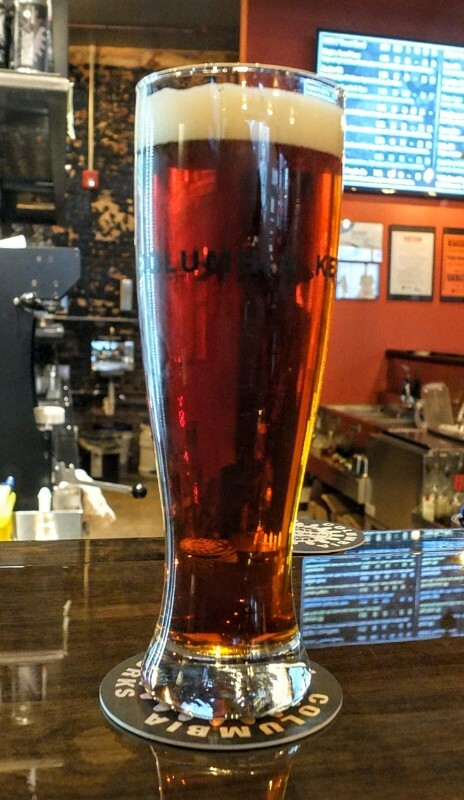 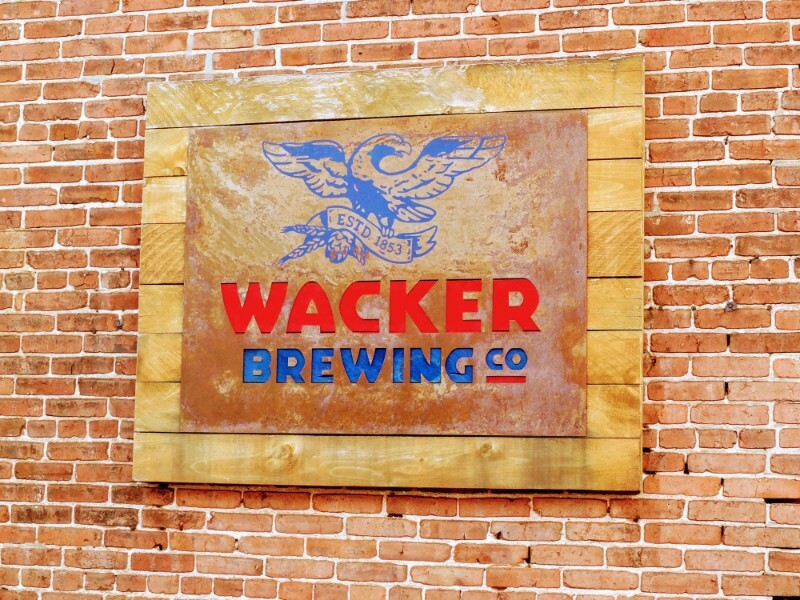 Wacker Brewing is named after an historic Lancaster brewer – there were several breweries in Lancaster from the mid 19th century into the mid 20th. 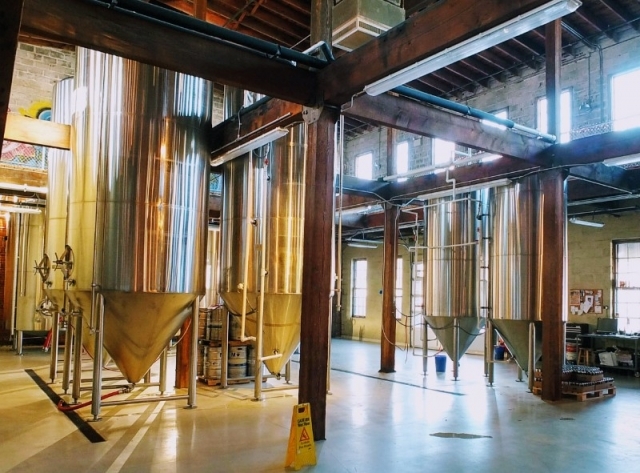 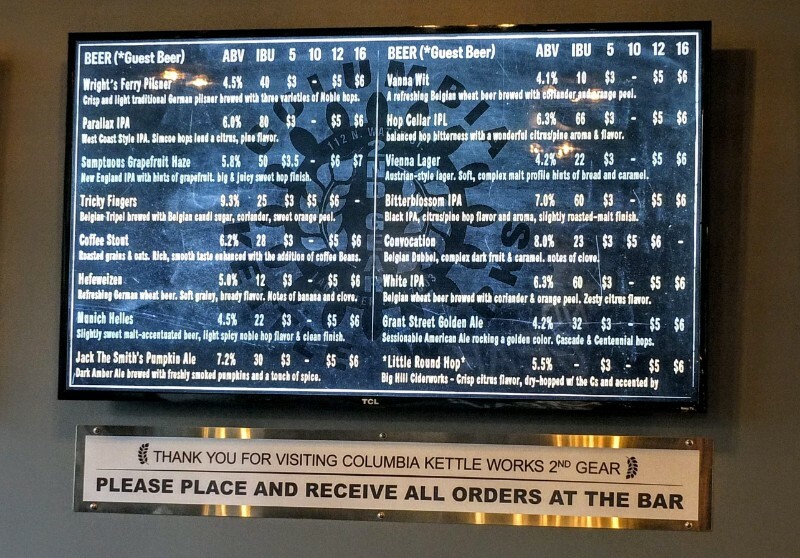 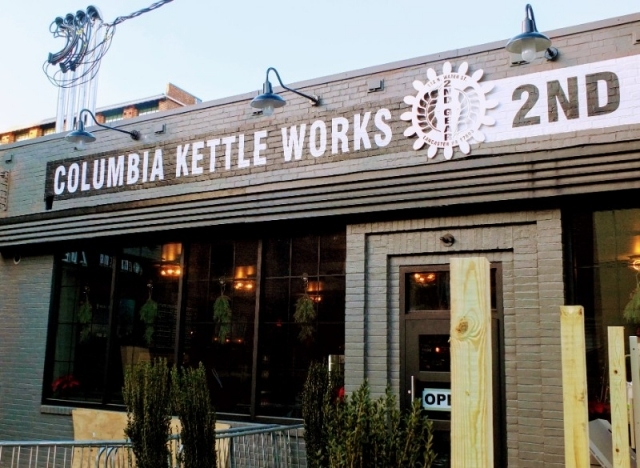 Columbia Kettle Works, located in nearby Columbia operates a taproom near the center. 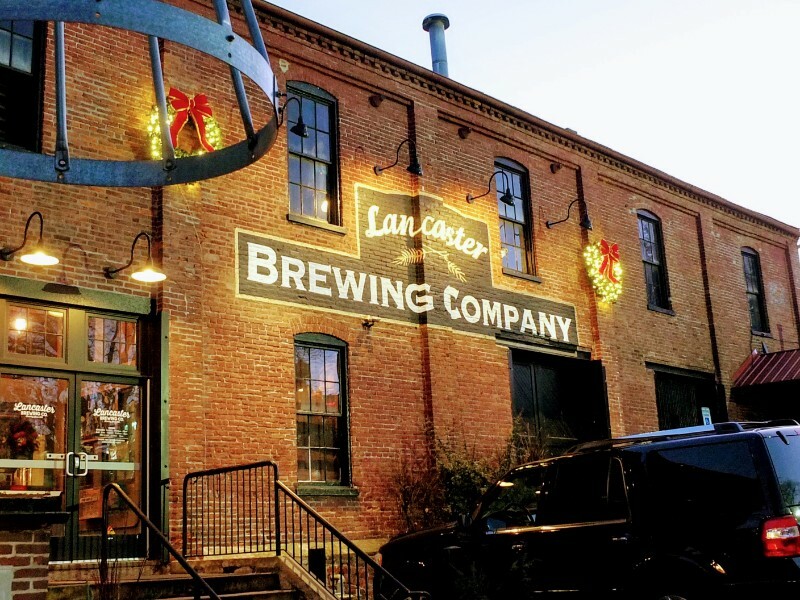 I ended the walk and caught my Uber at Lancaster Brewing is the oldest of the “new wave” of breweries here.